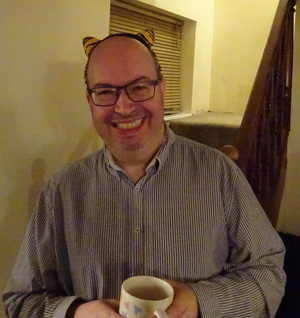 Following the success of our recent cat-themed Purim party, we gathered again in St George’s small hall for a traditional Kabbalat Shabbat evening. Ruth and Natan could not attend because Ruth was still recovering from recent major surgery. Amanda and Brian were also absent as the latter was awaiting major surgery. But we were delighted to welcome 4 students from Lincoln University. 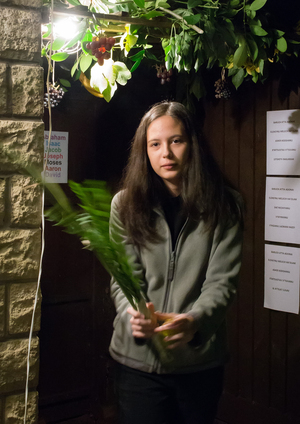 Sheleg has been with us for the past three years; Rachel attended a LIM meeting last Autumn. Yuval, who was at the Purim Party, came as well. And we were delighted to welcome Cassandra, a 2nd year drama student. And Naomi once again made the long journey from Liverpool to be with us. Reading from left to right, the photo shows Cassandra, Yuval, Rachel, Sheleg and Naomi. With D and K joining us via Skype we had well over a minyan, which was needed as three of us had Yahrzeits to commemorate. Steve led the service with plentiful singing in Hebrew from everyone. We had to use all our spare Eyt Ratson siddurim with so many visitors. Steve also explained that it was Rosh Chodesh for the month of Nisan and for this reason Micky read the special Maftir for Shabbat HaChodesh which set out the story and all the rules associated with the Passover. 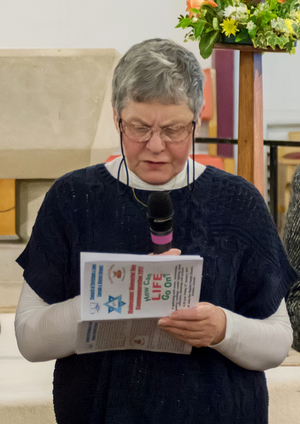 Towards the end of the service we also said the prayer for healing ‘Eyl Na R’fa Na La’ as we wished Refuah Shleyma to Ruth and Brian, and also to Maxine in France, who had not enjoyed the best of health in recent months. We said farewell to D and K after celebrating Kiddush together and then enjoyed a lovely meal that everyone had contributed to. Before ending the evening we planned who would do what for the Seder on 19 April and Steve took orders for individual requests for Pesachdik items for when he and Micky visited London the following weekend. 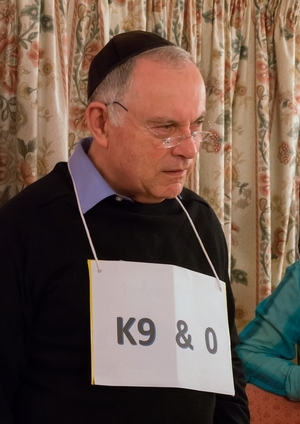 Each year at Purim we choose a theme for our LIM party. 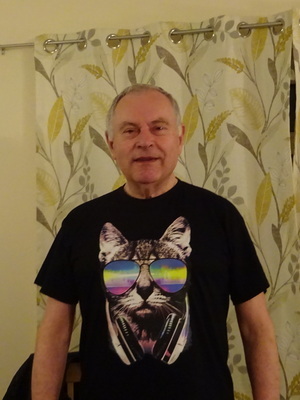 As most members are cat lovers (with Steve being the notable exception) we chose ‘cats’ as the theme. Kevin and Shelley very kindly hosted the party at their home. They really pushed the boat out decorating their lounge walls with pictures of people and animals having a cat connection such as Cat Balou, Cat Stevens, Cat-mandu and Cat-atonic. We all came wearing something with a cat theme. 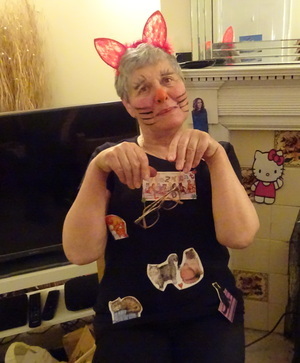 Both Jane and Olga even dressed up as cats. Micky and Steve chose to be a little less daring with their cat-logoed t-shirts. 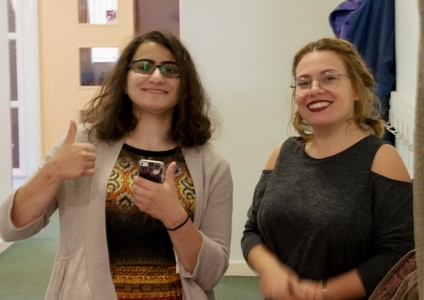 We were delighted to welcome a new LIM member: Yuval is an Israeli student in her first year at Lincoln University reading English. She is a very bubbly character and immediately joined in everything despite it being her first time among strangers. She, Kevin and Shelley wore cat ears as their contribution to the theme. Pawel took a particular liking to Micky’s Hamantaschen. After we had said goodbye to Devon we enjoyed a very sweet supper. Everyone had been encouraged to have something savoury at home and then bring anything for sweet course, but just enough for themselves and one or two others. 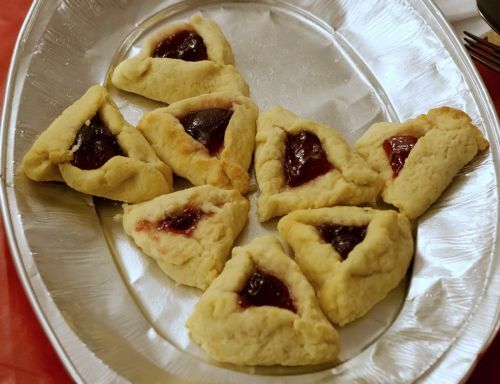 With Naomi unable to attend, Micky had made the Hamantaschen. We also had chocolate cheesecake, biscuits, flan, trifle and more chocolates. And this being a festival, there was not a single calorie in anything!! 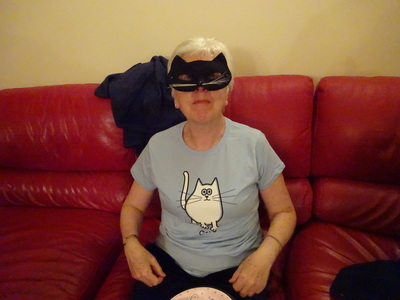 To round off the evening, Kevin and Shelley gave us all a party bag to take home filled with yet more cat-related pictures, stamps, notepad and a pencil. This has to have been one of the best Purim parties LIM has ever had. Our thanks to K and S for their very kind hosting and thanks to everyone for joining in the spirit of the occasion. 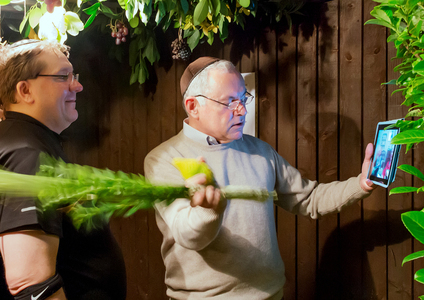 LIM members met once again at Micky and Steve’s home where a Succah had been built all bar the last few branches and fruity items. Folks were invited to bring these and add them to the structure when they arrived so that we could say everyone had helped to build it. Naomi was due to be with us, but a clash of lecture times prevented her from travelling over from Liverpool because she felt she ought at least to attend the very first two lectures of the term. 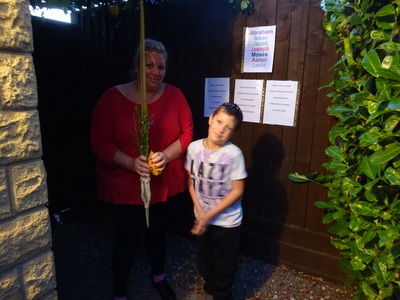 Kevin and Shelley were with us and so was Logan to experience his first ever visit to a Succah. As this was a Sunday evening we started with a short festival Ma’ariv service. 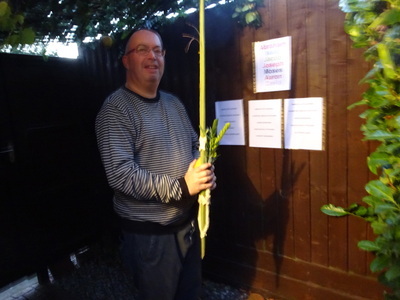 Steve then explained about the Lulav and Etrog and how to handle them before we each had a turn in the Succah. 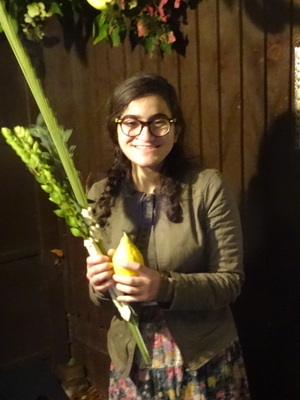 The one change we had made this year following advice from Naomi last year was to put the extremely expensive Etrog in the freezer and use it again this year. How well this might suit Halachah is up for debate, but it worked well enough for us. Afterwards we sat down to a delicious supper before discussing what we were going to do for our next meeting in November. 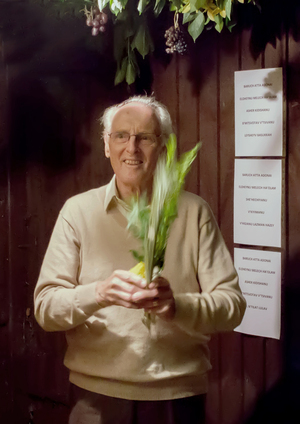 Erev Rosh Hashanah, Sunday, 9 September 2018 Once again Father Colin Taylor from the Roman Catholic Church of Our lady of Lincoln very kindly offered us the use of two of the church halls and the kitchen for our festival. We set out our synagogue in the smaller room and we ate in the larger room. D&K travelled all the way from Devon to be with us and Naomi made the journey from Liverpool where she is now studying for her Masters degree. Father Colin and 2 of his congregants also joined us for our services on both days. 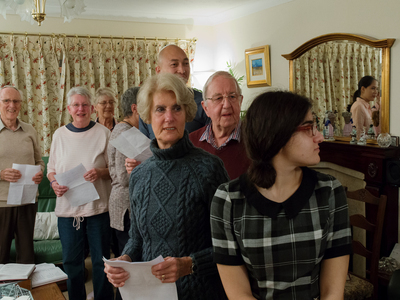 Despite the fact that LIM members bump into the special festival nusach and melodies just once a year, they soon got back into the swing of the occasion and ended the service with a lovely rendition of the Yigdal used only during the High Holydays. As usual we had a big meal afterwards, which began with apple and honey followed by home-made soup and round festival challah with lots and lots of delicious cakes to follow. Rosh Hashanah, Monday, 10 September 2018 For the morning services we were joined by Brian and Amanda who added very nicely to an already well-established minyan. Everyone had a role to play because in the Torah service we called up three people, have Haftorah and a short dvar Torah from Steve. When it came time to blow the shofar Dorothy went into the other room leaving the door open so we heard the sound coming from behind us. The acoustics made the shofar sound so haunting everyone was moved by it. After the service lunch was a table full of salads, fish, bread and again lots of cakes. Steve presented Father Colin with a donation from us for a charity of his choice. He told us he was going to combine our donation with other monies he had to support the victims of the recent flooding in Kerala in southern India. After lunch steve led a half-hour shiur (study session) on the topic of sin, what it was and why we should be reflecting on our lives as we spend the coming days leading into Yom Kippur. He then led everyone through the ‘vidui’ the litany of sins that we recite several times during Kol Nidre and Yom Kippur, as a foretaste of how we should be resolving to improve our ways and our attitudes. We then all walked to a small stream nearby to celebrate Tashlich. We managed to get back indoors before the rains began. D&K then had to leave us to travel home so the rest of us sat down to a cup of tea and eat more cake. We are hugely indebted to Fr Colin for his amazing generosity in making his church halls available to us. And to put the cherry on the icing on the cake, Fr Colin has confirmed that we have use of the church halls again in 2019. We gathered once again in the small hall of St George’s Church for an evening of spiritual nourishment and togetherness. Naomi was by now gone for the summer and would not be back until High Holydays. Even so, we just managed to have a minyan as Ruth and Edna had yahrzeits as well as Micky. Once D and K had joined us on Skype, Steve led the service, but everyone was by now so familiar with the music and the Hebrew that he acted as little more than a caller of page numbers. There then followed a lovely supper filled with laughter and happy conversation. Our next meeting would be the annual fish and chips lunch at the Bardney Heritage Centre in August. 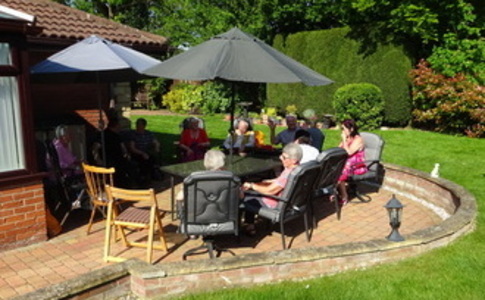 At last blessed with warmer weather and lighter evenings, we could all come together for a very enjoyable and warm – literally – evening of davening and socialising. With D and K on skype and everyone else present except for Sheleg who had already left Lincoln at the end of her university studies for the term, we once again comfortably had a minyan which is especially important throughout this year to enable Micky to say Kaddish for her mother. The singing and individual participation was truly comforting and demonstrated how well we come together as a small community in support of each other. 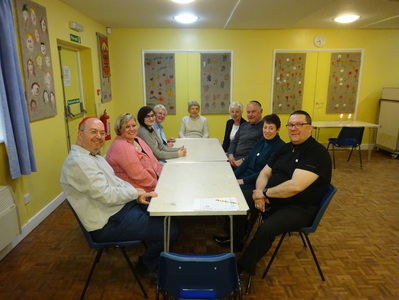 After the service led by Steve, we all enjoyed the usual supper and then planned for the next meeting in July. 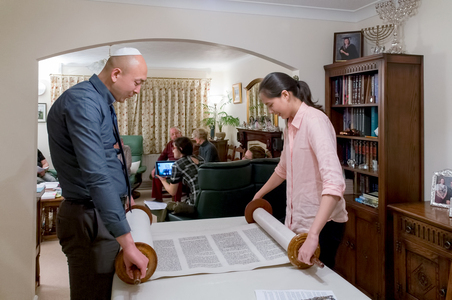 As is now our custom, LIM members met on Shavuot at Steve and Micky’s home to celebrate Shavuot with a short study session and a lot of cheesecake. 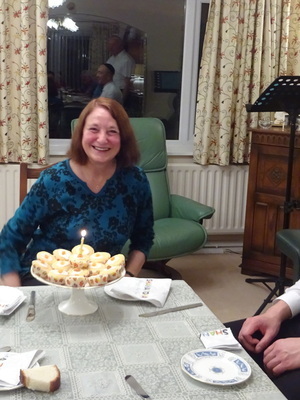 This year we were pleased to welcome Amanda and Brian for the first time to our Tikkun Leyl. Steve gave a short explanation of the historical background to the festival, the counting of the Omer, the connection to Pesach and how it originally had nothing to do with Zeman Matan Torah (the giving of the Torah), but was, according to the Torah, to be celebrated as an agricultural pilgrim festival. After the destruction of the temple and the greater urbanisation of the people, the agricultural aspect diminished. Scholars had calculated that the conclusion to the period of counting of the Omer coincided chronologically with the events on Mount Sinai. Thus was created and developed the connection of Shavuot with the giving of the Torah. Kabbalists added to the festival the idea of Tikkun Leyl Shavuot and all-night study to ensure the people were prepared to receive the Torah. Reading the Book of Ruth was also connected to the Festival as both events occurred at the time of the Spring harvest and Ruth’s acceptance of and dedication to the Torah acted as an exemplar for us all. We then read the Book of Ruth and discussed each chapter briefly to highlight the significant teaching points. We all enjoyed Micky’s cheese scones followed by excellent cheesecake bought from the International Stores shop in town. This was accompanied by some gorgeous fresh fruit salad for those with a guilty conscience about ruining their diet. Steve had deliberately kept the study aspects more factual this year after last year’s more light-hearted and fun approach. We can never seek to emulate the fully-fledged communities who study all night long, but we did what we knew we could and all felt well prepared to receive the Torah, even if only figuratively. 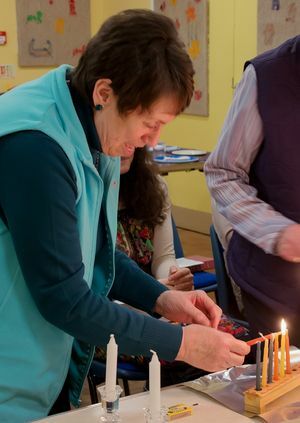 Our small community enjoyed a wonderful celebration of Shabbat Shacharit this week. 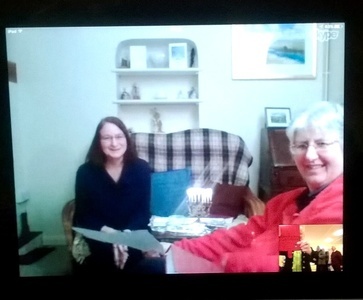 Happily, we once again had well over a minyan despite As usual, we enjoyed having Dorothy and Karen join us via Skype, which enabled Ruth and Micky to say Kaddish. Steve led us all through the Pesukay D’Zimra and Shacharit services. The Torah service was especially meaningful this year because this was the first time we were able to call Pawel up to the Torah, which was followed by a rousing rendition of the shehechiyanu blessing. Steve explained the content and some interpretations from the double Sidra Acharet Mot – Kedoshim. Micky then read the Haftarah. The service ended with a rousing rendition of Ein Keloheynu, Aleynu and Adon Olam. After the service we made Kiddush while Karen and Dorothy were still with us. 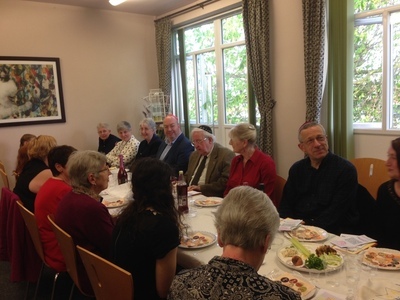 We then enjoyed a wonderful lunch together before planning the Tikkun Leyl Shavuot meeting. This year we were very fortunate to be back in St Georges for the Seder Night, it being also Good Friday and therefore we were not in competition with any Zumba classes. Sheleg was away in Europe with a friend. Brian and Amanda were celebrating with family. Otherwise, we were all here and, in particular, we had the added joy of having D and K with us rather than via skype. Our special guest this year was Revd Tim Voltzenlogel, the recently-installed vicar at St Georges. We were delighted that he could accept our invitation on what for him must have been a busy day in the Christian festival calendar. We were also pleased to welcome Jacob and Logan, Kevin and Shelley’s boys. They must enjoy the Judaism, though I suspect the food had a lot to do with it, too. Steve led the service, providing transliterated Hebrew for all the main elements for those for whom Hebrew was a bit of a challenge. Thus, everyone joined in the singing with great enthusiasm and helped with the reading of the Seder story. Everyone contributed to the delicious Seder meal in a variety of ways. This was another wonderful evening of welcoming guests, friendship, laughter, communal generosity and co-operation, everyone having something to contribute, everyone taking away a happy memory of a festival celebrated in traditional style, but in a manner that enabled everyone to participate. 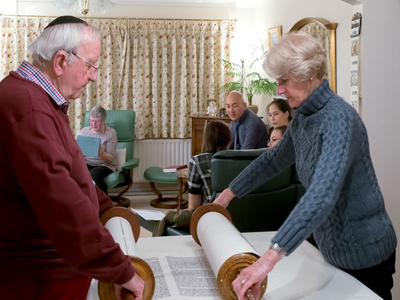 Our next meeting on 28 April will be a Shabbat Shacharit and Torah service. Following the disappointment of having to cancel the Purim Party because of the deep snow and very bad weather in the area, we all met in determined mood to celebrate Shabbat together a couple of weeks later. Once again we were delighted to welcome Amanda and Brian Grant, who had recently moved to a village just outside Sleaford. On this occasion we had the added advantage of enjoying Challah that Brian had made. D and K joined us via Skype and Naomi came over from Derby to be with us. So we were 15 altogether! Steve led the service with everyone joining in with the singing. It really was a delight that we could ensure our visitors were able to participate so fully in Hebrew. We are blessed to have the use of the Eyt Ratson siddur. 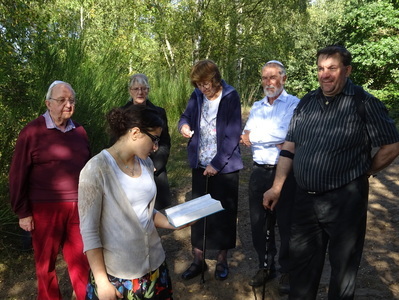 It was also good for Micky to have such a large gathering to say Kaddish with her in memory of her mum. 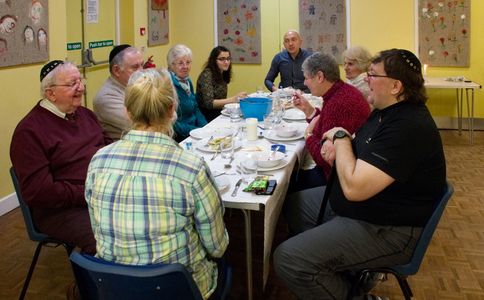 After the service we made Kiddush before saying farewell to D and K.
We then enjoyed a convivial and delicious supper together before planning our next meeting, which will be the Passover Seder on 30 March. This was our first Kabbalat Shabbat of 2018. Very sadly, we had to cancel the one planned for early January following the passing of Micky’s mum, Lorna. Micky was overwhelmed by the messages of condolence and support from every LIM member, both here and overseas. 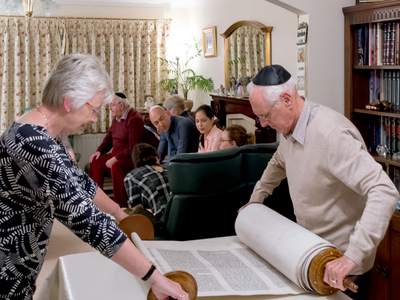 Quite amazingly, we had to use every copy of our Eyt Ratson siddur because, in addition to all our regular LIM members, we were delighted to welcome Amanda and Brian Grant, who had recently moved to a village just outside Sleaford and had contacted us through the website to ask to join our little kehilla. We were also pleased to welcome Robin and Caren Young. They are members of LJC. Robin is on the CCJ committee as my ‘Jewish’ successor. They were both at the recent Holocaust Memorial Day commemoration and had asked if they could attend our next LIM service and what delightful guests they were. D and K joined us via Skype and Naomi came over from Derby to be with us. So we were 19 altogether! We then enjoyed a convivial and delicious supper together before planning our next meeting, which will be the Purim Party on Wed, 28 February at 6.30pm in St Georges hall. 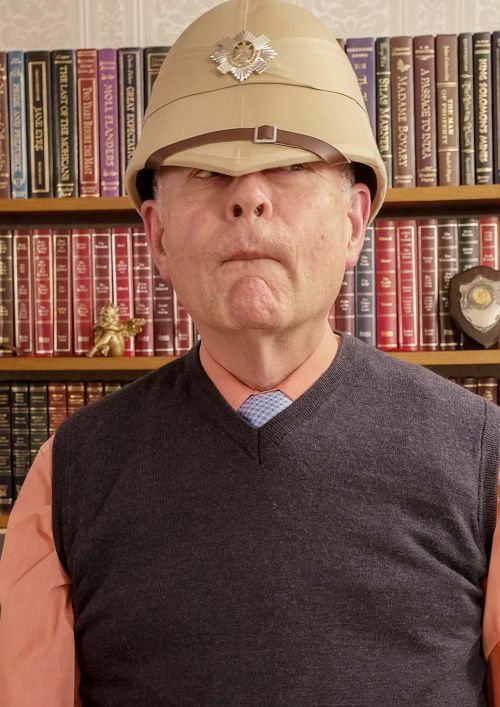 We will return to the theme of silly hats. Once again Steve worked with Lincoln CCJ and Fr Stephen Hoy, Parish Priest at St John the Baptist Church up on the Ermine, to create a commemorative service to mark HMD 2018. The theme this year was ‘The Power of Words’. 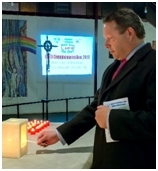 The event began with the deputy Mayor of Lincoln lighting the special ‘Auschwitz’ candle that the church had been selected as one of just 70 in the whole country to use when it was the 70th anniversary of the liberation of Auschwitz back in 2015. The evening was a mix of candle lighting, blessings, poetry, music, readings and testimony. Steve had sourced quotations to demonstrate the power of words to cause hatred and destruction and then the power of words to heal and bring peace and love. Fr Stephen had selected some beautiful music, both orchestral and sung, to compliment the theme and the atmosphere being created. Over 80 people attended and at one point all were invited to come forward to light a memorial candle and place it on the altar. Nine LIM members attended plus 2 from LJC. 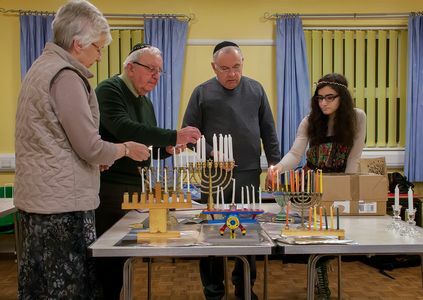 It was a very good Jewish representation and served to remind everyone how we can join in interfaith events such as this with authenticity and sincerity. 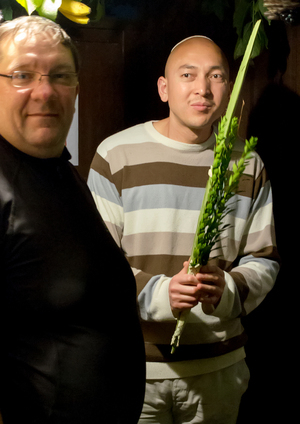 Micky and Steve had built a Succah again at their home and had brought the Lulav and Etrog from London when they were down there for Yom Kippur. 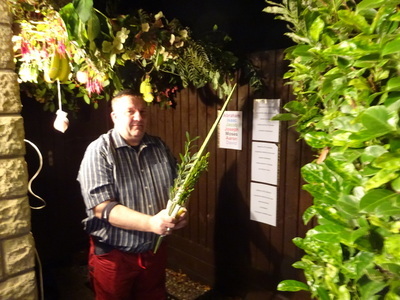 Folks, as they arrived, helped to complete the Succah by hanging fruit from the roof. Sheleg was back with us after her summer break in Thailand and Israel. Margaret and Edna brought a cousin Joan who was visiting them from Hendon. Naomi came over from Derby to be us, too. D and K joined us by Skype. We started with the regular Friday night Shabbat service followed by Hallel because it was a festival. 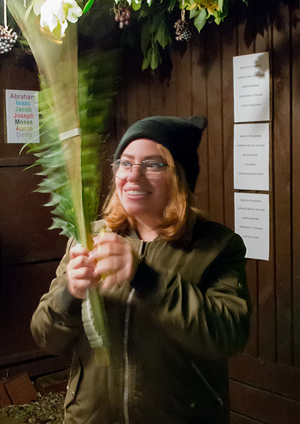 Steve then explained about the Lulav and Etrog and how to handle them before we each had a turn in the Succah. 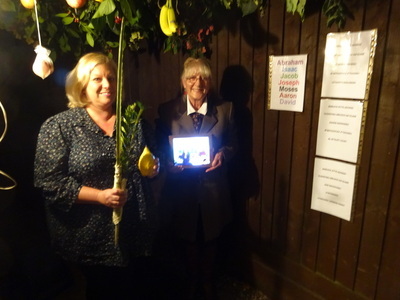 Ruth was in charge of D and K and took them into the Succah via Skype on the IPad. Afterwards we sat down to a supper of vegetable stew with dumplings, fruit crumble and custard or/and fresh fruit salad with crème fraiche. 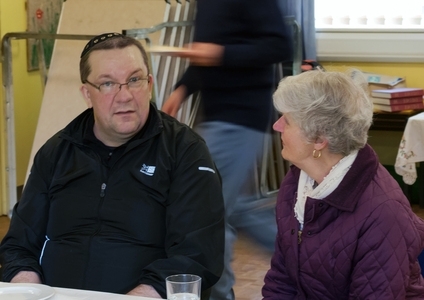 We did a short grace after meals before Steve gave out a planned programme of our services for next year and we discussed what we were going to do for our next meeting in November. It was a lovely evening celebrating one of our many festivals amongst friends. Father Colin had to attend a funeral in the morning so was unable to join us for our service but was back in time for the lunch afterwards. We all participated because in the Torah service we call up three people, have Haftorah and a short dvar Torah from Steve. When it came time to blow the shofar Dorothy went into the other room leaving the door open so we heard the sound coming from behind us. The acoustics made the shofar sound so haunting everyone was moved by it. After the service lunch was a table full of salads, fish, bread and again lots of cakes. Steve presented Father Colin with a donation from us for a charity of his choice. He told us he was going to combine our donation with other monies he had to support the Rohingya refugees of Myanmar. 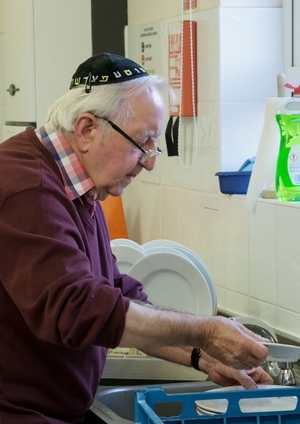 He said on this day of Rosh Hashanah it was very special that a Jewish community, jointly with a Catholic one were supporting a charity that helped members of the Muslim faith. After lunch we all walked to a small stream nearby to celebrate Tashlich. We managed to get back indoors before the rains began. D&K then had to leave us to travel home so the rest of us sat down to a cup of tea and eat more cake. 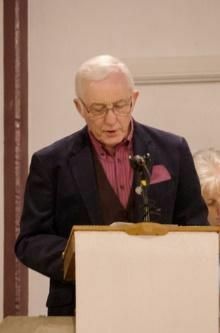 We are hugely indebted to Fr Colin for his amazing generosity in making his church halls available to us, even cancelling a scheduled bingo session on the Wednesday evening so that we would not be disturbed. And to put the cherry on the icing on the cake, Fr Colin has confirmed that we have use of the church halls again in 2018. 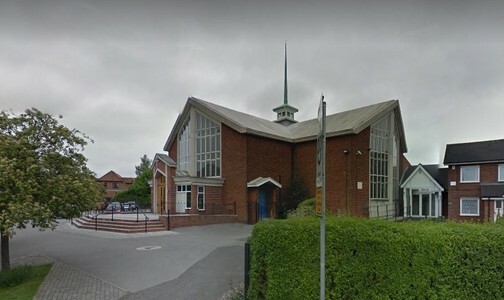 This year Father Colin Taylor from the Roman Catholic Church of Our lady of Lincoln very kindly offered us the use of two of the church halls and the kitchen for our festival. We set out our synagogue in the smaller room and we ate in the larger room. D&K travelled all the way from Devon to be with us and Naomi made the journey from Derby. Father Colin and 2 of his congregants also joined us for our service on Erev Rosh Hashanah. Despite some of the tunes being different because it is a festival we still managed to join in the singing. As usual we had a big meal afterwards, which sticking with LIM tradition, was home-made soup and bread with lots and lots of delicious cakes to follow. This being the middle of August, our numbers were down for the Erev Shabbat service and meal. All the university students were away from Lincoln. Despite this, we still had a Minyan with Dorothy and Karen connecting in by Skype from Devon. This was important because Steve had a yahrzeit for his father and wanted to be able to say Kaddish. We were planning a music evening, but instead of singing various zmirot, after the service and supper Steve led everyone in the full Birkat Hamazon, Grace After meals. We had perhaps been a little lazy of late singing our lovely shorter version “Brich Rachamana…”. Steve had found a much clearer transliterated version of the full Birkat Hamazon using our more familiar Ashkenazi pronunciation. It proved to be ideal and soon half-forgotten tunes were ringing out round the room. 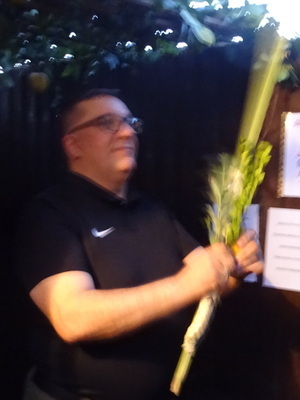 To end the evening, Steve reminded everyone of the need to start to prepare for Rosh Hashana, and we all agreed once again to support the local food larder for our Kol Nidre Appeal. 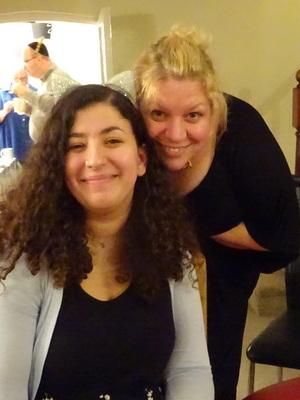 Finally, we all looked forward to meeting Naomi’s parents and having a Shabbat evening with them when they will be over here in early September for Naomi’s university graduation. 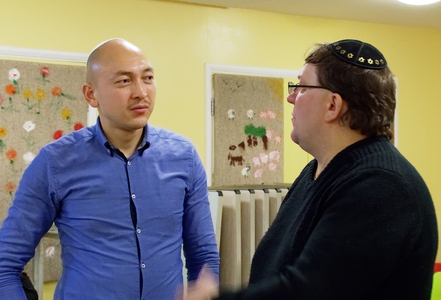 The Minyan met once again at St Georges Church Hall to celebrate Shabbat with a Shacharit and Torah service. Steve led the service with help from six other members. Sadly, all our university students have gone home for the summer and only Sheleg will be returning. Salome was here for just one year and Naomi has completed her 3 year course. Naomi hopes to meet up with us once she is settled in Derby for a one year placement. Kevin had his first call up with us so we chanted the shehechianu afterwards. Despite the small numbers we were all in fine voice including our dear friends in Devon. We made Kiddush before saying goodbye to D&K then we washed hands ready to eat. The lunch was delicious as usual, especially Shelley’s stuffed peppers. Having a leisurely meal together means we have time to chat and catch up on the last few weeks since we met. 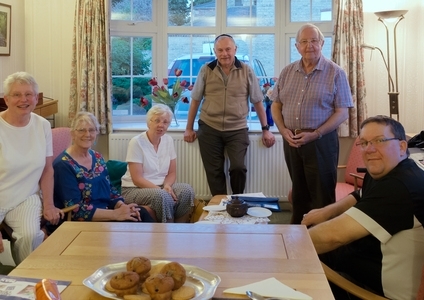 Ruth, Natan, Micky and Steve had just returned from a visit to our friends in Devon so they had lots to talk about. The next meeting will not be on Friday 14th July. Instead we are going to meet for a social outing in Bardney on Saturday 15th July. 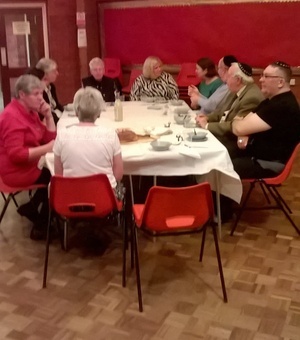 We met again on Friday 19th May for an ErevShabbat service and meal. Our numbers were down a little bit because of illness and family commitments. 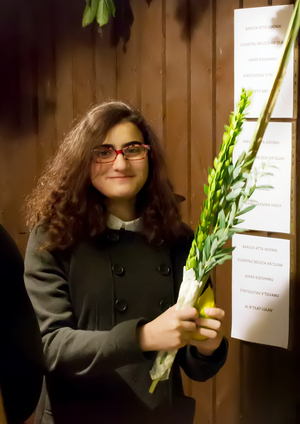 Also, Salomé was not well enough to attend her last meeting with us so we wish her well on her return to France and thank her so much for being part of our little Minyan this last year. 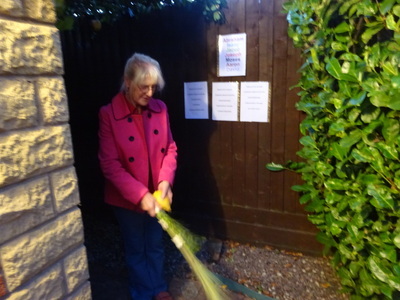 It was good to see Kevin and Shelley who readily joined in with everything, including the clearing up. Jessica joined us for a final time before she leaves university and goes back home to the Isle of Man. 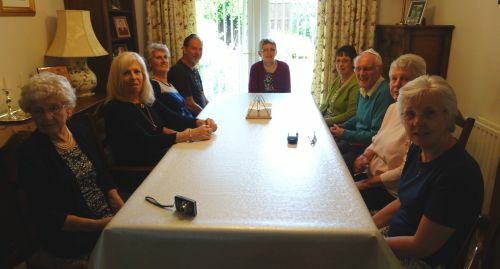 Despite missing three of our stalwart members, we still had a Minyan with Dorothy and Karen connecting in by Skype from Devon. This was important because Steve, Pawel and Kevin all had yahrzeits for relatives and therefore the need to say Kaddish. 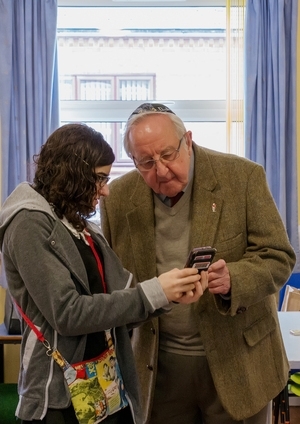 We were also sad to hear of the passing of Max Gold from Hull who has been a keen supporter of our group and remembered him in our Kaddish. 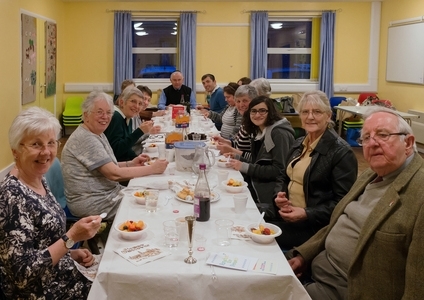 After Kiddush and saying farewell to Devon, we overdosed on the carbohydrates this Shabbat but we all enjoyed the jacket potatoes with fillings, lokshen pudding and fruit crumble. Our next meeting is Tikkun Leyl Shavuot on Tuesday 30th May. 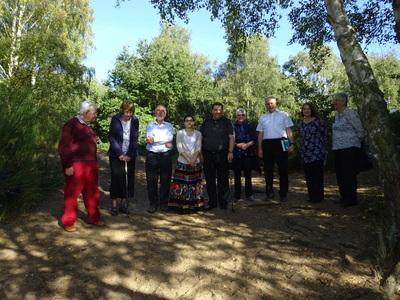 This year we were very fortunate to have the use of the Chaplaincy Centre in Bishop Grosseteste University thanks to the great generosity of Revd Peter Green, the BG Chaplain. Steve had sent everyone maps and directions to find the venue and everyone arrived in good time and without too much difficulty. Special guests this year were Kevin and Shelley Pascovitch. Kevin had contacted us via the website email address saying that he was Jewish and would like to connect with LIM. It was only natural therefore to invite him to meet us all at the Seder and we were delighted that they were both able to be with us. 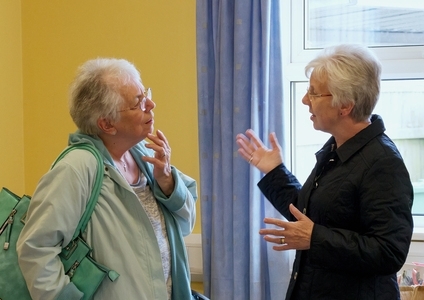 We were also delighted to have Dorothy and Karen with us in person rather than via Skype. Unexpectedly, Pawel was not at home when we called to collect him. Only later did we discover that he had rushed back to Poland following the sad death of one of his brothers. We were also very pleased to have Steve and Micky’s daughter Abi and her two children, Megan and Sophie, with us for the festival this year. Before we began proceedings proper, we presented Naomi with gifts and a card from us all on the occasion of her upcoming 21st birthday. 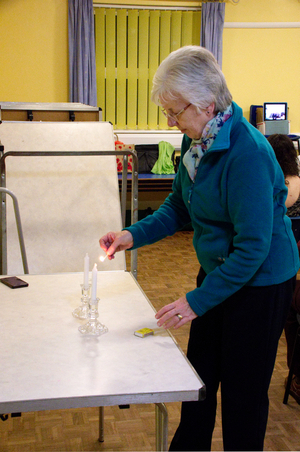 Naomi then started the Seder by lighting the festival candles. 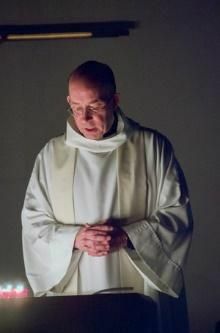 Our thanks again to Revd Peter for his very kind and generous hospitality in allowing us the use of his Chaplaincy Room. We all gathered at St George’s Hall on the evening of 11 March to find the doors locked. 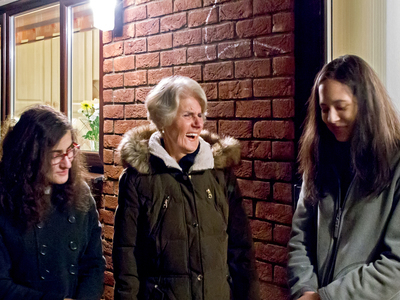 No problem – Steve and Micky live nearby so they offered their house for the celebration. We were blessed with having 4 students from Lincoln Uni on this occasion. As well as Naomi, Sheleg and Salomé, we had the pleasure of Jessica’s company. 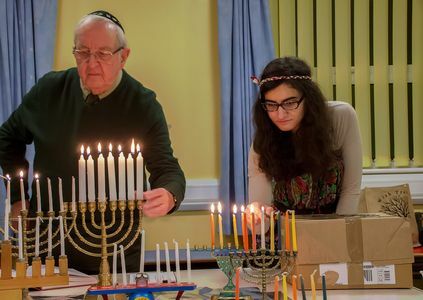 She is a Christian student who is focussing on Judaism as her central topic and was with us for a recent Shabbat service and was now back again to witness our festival. We started the evening with Havdalah as Shabbat was just going out. Steve then did a lot of explaining for our non-Jewish guest so she would understand the relevance of everything we were doing. 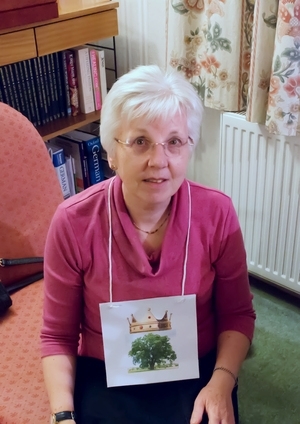 Then it was onto telling the story of Esther and reading Steve’s abridged version in ten parts so many of us got the opportunity to take part. We all had rattles and whistles making as much noise as possible when Haman and Mordechai’s names were read out. Even our little French student took part getting her tongue round Ahashchverush with far greater success than anyone else. After all the fun of the reading we were then ready for our supper. A slightly different meal to what we normally have but just as enjoyable – Steve’s home- made pitta bread with falafel and Sheleg’s delicious Israeli salad. Then onto fruit salad plus Naomi’s eagerly-awaited and wonderfully delicious Hamantaschen. 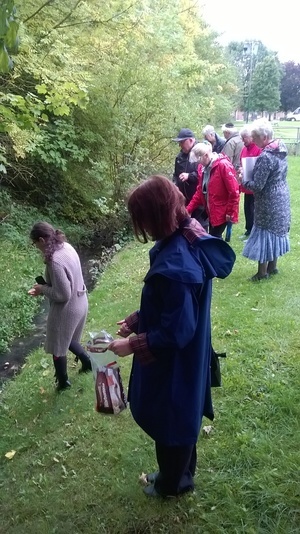 This was another hugely successful LIM gathering with lots of fun and laughter, some delicious foods and a poignant wander down memory lane for many of us. We ended the evening planning our next event, which will the 1st Night Seder on Monday, 10 April, to be held in the Chaplaincy Centre of Bishop Grosseteste University. We are looking forward to welcoming Jessica back again and having Ellis, Karen and Dorothy all with us in person. 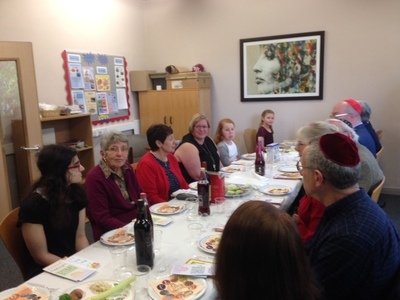 Our small community enjoyed a wonderful celebration of Shabbat Shacharit this week. Happily, we once again had well over a minyan despite Salomé not being with us through a nasty cold. As usual, we enjoyed having Dorothy and Karen join us via Skype. Steve led us all through the Pesukay D’Zimra and Shacharit services. The Torah service was especially meaningful this year because the Sidra – Beshallach – described the crossing of the Red Sea and the Shirat Hayam, Song of the Sea that the people sang afterwards. Before leyning Shirat Hayam, Steve gave a detailed description of the Torah portion. He then described how the Haftarah was closely themed with the Torah story before reading about Deborah, Jael and Sisera from the book of Judges. The service ended with a rousing rendition of Ein Keloheynu, Aleynu and Adon Olam. After the service we made Kiddush while Karen and Dorothy were still with us. We then enjoyed a wonderful lunch together comprising gorgeous hot, home-made soup that was ideal on such a miserable, cold and wintery day. After lunch we continued our revision of the full Birkat Hamazon before planning the Purim party. Holocaust Memorial Day Theme: How Can Life Go On? Some 110 people gathered at St John the Baptist Church to commemorate HMD 2017 – an evening planned jointly by the Church, CCJ Lincoln and LIM. Members of these organisations were joined by the MP and Deputy Mayor of Lincoln, the Bishop of Grimsby and members of the local Muslim community and Lincoln Castle Academy School. In compiling our programme, we were grateful for the very helpful material on the HMD Trust web-site. Anyone wanting more information about this material is encouraged to search their site. Karl McCartney, MP for Lincoln, opened the Commemoration with the lighting of the Auschwitz Memorial Candle (St John’s was one of 70 churches nationally to receive one of these two years ago). We listened to the poem, “How Can Life Go On?” and reflected on it to music by Ilse Weber (herself a Holocaust victim) entitled “Farewell comrade”. 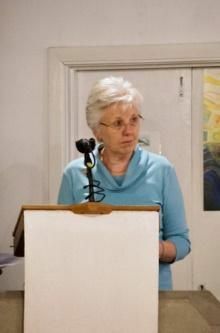 Accompanied by slides we thought further about “How people survive.” Firstly, Olga read stories about Auschwitz itself. Jane then followed with a description of Holocaust survivor Simon Winston. Peter ended this part with a description of the experiences of Holocaust survivor Rudi Oppenheimer. Again, accompanied by slides we thought about how people suffering inevitably from post-traumatic stress disorder can rebuild their lives. We heard about Hope Azeda from Ruanda who has coped by forgiving and using her experiences to educate others and Abdul Aziz Mustafa from Darfur who has rebuilt his life in Britain after a perilous journey. This time we reflected to Carl Davis’ “Liberation” and the song “Al Shlosha D’Varim” sung by local community choir, Ermine Voices. Our ‘act of remembrance’ began with “A Catalogue of Man’s Inhumanity: Past and Present”. 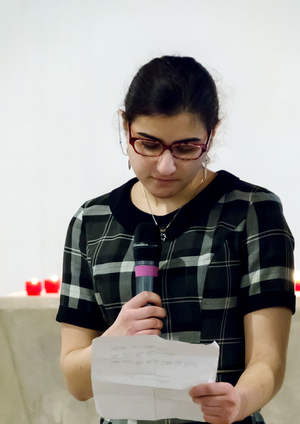 Olga followed this with a recitation in English of the Jewish Memorial prayer ‘Eyl Malay Rachamim’. The congregation was then invited to process to the front of the church and each light a candle and place it on the altar – at the end of which, the lights were dimmed and we meditated in silence before a litany was read. The service concluded with the Aaronic blessing in both Hebrew (read by Naomi) and English and the playing of Levandowski’s Psalm 150. Over light refreshments, a great time of fellowship was enjoyed. We are very grateful to everyone at St John’s for their hospitality and to everyone who took part in this solemn act of commemoration. Despite the threat of snow and it being very cold we still gathered together for our Friday night service and meal. Edna and Margaret decided not to chance the weather turning nasty and Sheleg and Salome were still away but Peter, Pat and Naomi were back with us after their Chanukah holidays. 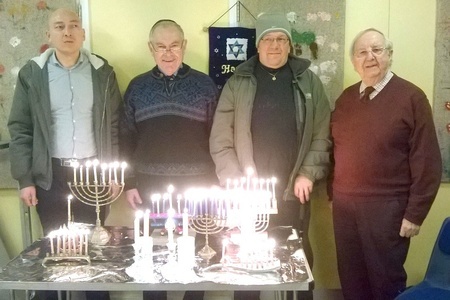 We linked up with our country members and then Micky lit the Shabbat candles. This was followed by a lovely service led by Steve. After the service, we handed out a couple of the Hanukah presents that D and K had sent to those who had not been at the Hanukah party. We then made Kiddush before saying goodbye to Dorothy and Karen. We sat down to our first three course meal we have shared together. Pawel was keen for us to try his special recipe borscht followed by pirogi with yoghurt; then we had salmon, quiche, salad and finally cheesecake and fresh fruit salad. The task of washing up after the meals has always been a doddle with so many helping in the kitchen. With the table cleared and the chores done, we bensched full grace after meals which we hadn’t done for a long time because Steve had found a short version which we had all become used to singing. 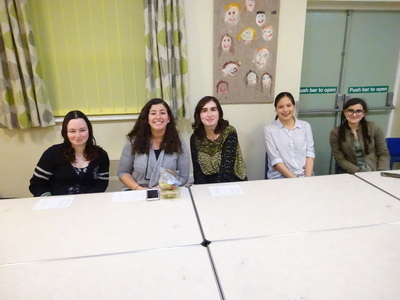 We then planned our next meeting which will be a Shabbat Shacharit and Torah service and meal on 11 February. 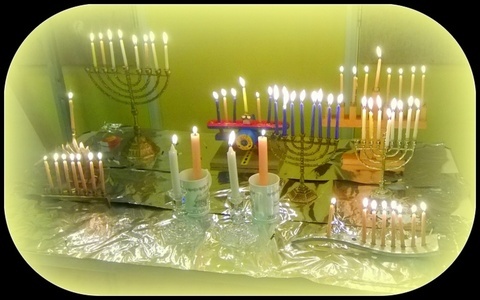 On Friday 30 December we celebrated our 6th Hanukah together. We met as usual in the small hall of St Georges Church, which was really rather cold because the heating system was not working properly. Never mind, most of us just kept hats, gloves and outside coats on for the first half of the evening. It was also a very dark and icy night so quite sensibly Edna and Margaret had emailed to say they would not risk the long dark journey through Lincolnshire more challenging quiet country roads. D and K, plus Mulberry, joined us from Devon via Skype. After setting out the tables and chairs, we all lit our Hanukah candles. Steve had brought spare Hanukiot and candles so just about everyone had the opportunity to light. 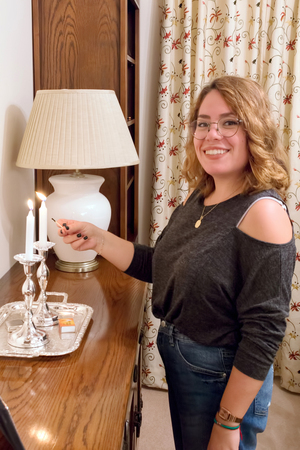 This being the start of the 7th day of the festival meant that the room was very quickly bright with 56 festival candles plus two lots of Shabbat candles that we lit once the Hanukah candles were all ablaze. Steve then explained the historical background to Hanukah including all the politics of the time which was really quite complicated. We had arranged the chairs in two lots of 4 either side of the table of candles so that D and K could see us all plus the candles. Somehow, we ended up looking very frum with the four ladies sitting on one side quite separated from the menfolk. 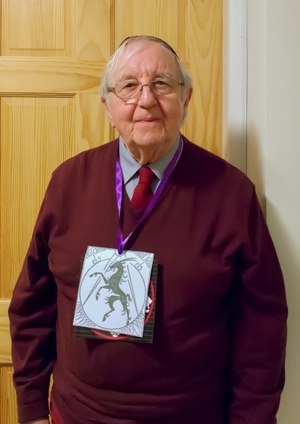 Steve then produced his trusty egg timer and led us through the traditional 2½-minute AGM the key message being that we had enjoyed our 6th year together filled with a rich programme of spiritual and social gatherings and had managed to more than pay our way. Next came the opening of presents. Last year D and K had surprised us all by sending each one of us a small gift. They did the same again this year. Jane had received in the post a very large box that revealed individually wrapped gifts for us all. Steve had sent them gifts on behalf of us here in Lincoln. 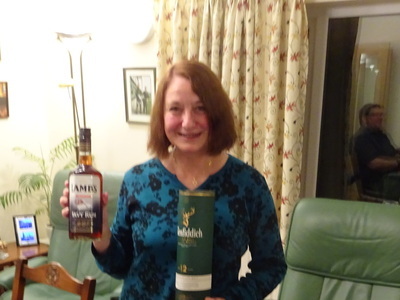 With Karen in mind, whisky certainly featured somewhere. To complete the celebratory atmosphere we all presented Pawel with a small cake and cards as it would be his birthday in the following week. Before closing the link with Devon we made Kiddush and then, after washing and making motsi, we sat and ate a delicious meal of the traditional potato latkes, salads and other goodies, culminating in the anticipated superb doughnuts that Edna and Margaret bought from their local bakery and sent over to us knowing that they would not be able to attend because of the weather. As a final extra surprise, Steve and Micky then presented us all with more gifts. We were all like small children. This was our first Kabbalat Shabbat after the High Holydays and the ensuing major festivals. The Chagim are spiritually and communally rewarding, but emotionally exhausting so it was a welcome experience to return to the old tried and tested rituals of a regular Friday evening. 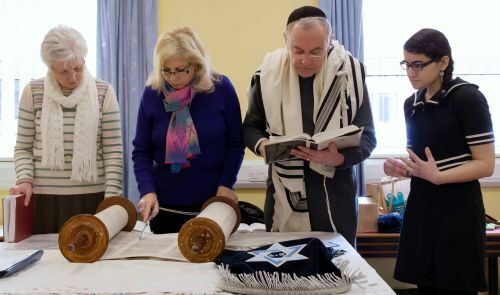 With Maxine and Steve now away in the States, we nevertheless had a minyan with Edna and Margaret making a welcome return with Naomi and with D and K joining us via Skype from Devon. We also had the pleasure of Pawel, Sheleg and Moshe’s company. After Naomi had lit the Shabbat candles, Steve led the service with everyone joining in with the singing. It really was a delight that we can now all participate so fully in Hebrew. We are blessed to have the use of the Eyt Ratson siddur. The service included Yahrzeit prayers for relatives of two members, so we were equally pleased that we had a solid minyan for our service as we have had most of this year. 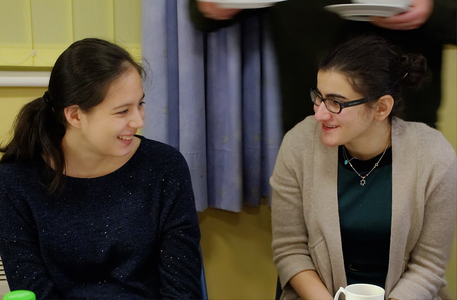 After the service we all enjoyed a convivial and delicious supper together. We then planned our next meeting which would be the Hanukah party. As with all events in this Jewish Leap Year since the insertion of the month of Adar II earlier in the year Hanukah will be starting very late with the first candle being lit on Christmas Eve. 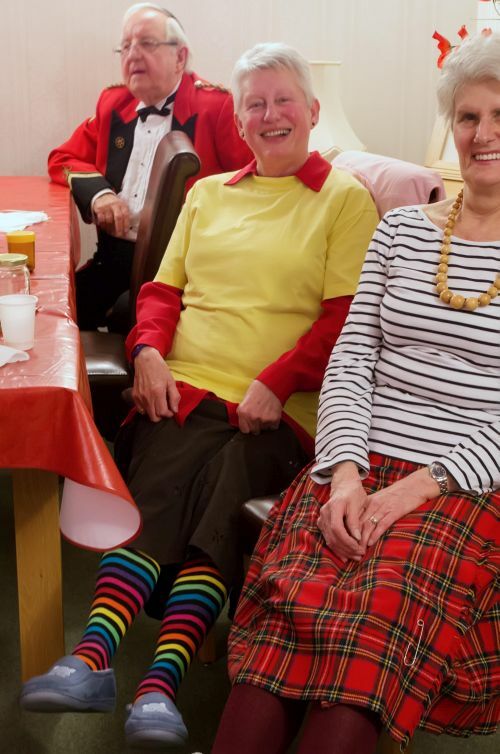 Our party will be on 30 December with its attendant 2½ minute AGM, plus hopefully the delicious latkes that Naomi makes and the mouth-watering doughnuts that Edna and Margaret bring. 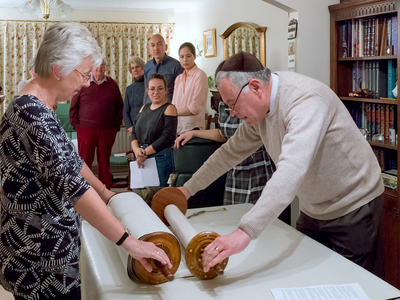 This was the third year in which we attempted a mini ‘leynathon’ whereby everyone read one verse from the final chapter of the Torah and then, after re-rolling the scroll, one verse each from the beginning. 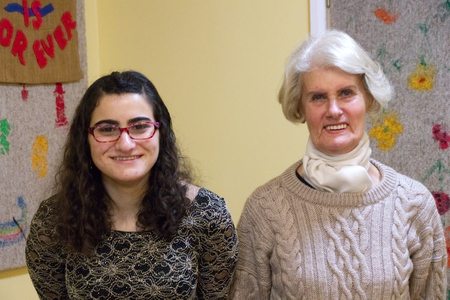 We were delighted to welcome not only Naomi, but also the three new LIM members from the uni – Salome, Moshe and Sheleg. We were also successfully linked to D and K in Devon. Salome opened proceedings by lighting the festival candles. Steve explained how, traditionally, a community would honour two deserving members by appointing them as Chatan Torah and Chatan Bereshit to read the Brachot before the Torah readings at the end and then the beginning of the Torah. Since everyone in LIM was equally deserving of honour he called everyone up to take part in the leyning of the final 12 p’sukim of the Torah. Half the fun was getting everyone in the right order, not forgetting D and K on Skype. Naomi followed the text in the Torah as each one in turn came forward to read their verse, first in Hebrew and then in English. Another Simchat Torah tradition would be for members to dance 7 times around the synagogue carrying the Torah. These Hakafot would be hugely exciting and accompanied by great joy. The trouble LIM has is that the Torah weighs a ton and we need two just to do Hagba. So Hakafot were off the menu. 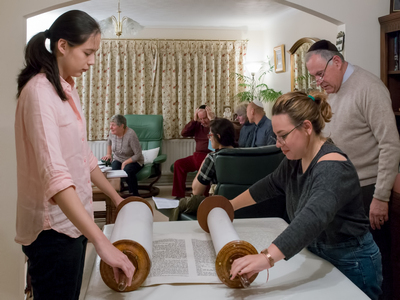 To enable everyone to participate, to get close to the Torah and better still to feel confident in handling it, Steve then invited everyone to take turns to be at the ‘rolling’ end and at the ‘steadying’ end. This being the fourth year we had done this, everyone soon got back into the swing of the process taking great care and reverence for the scroll. At last Bereshit hove into view. Steve then got everyone lined up in the right order to take turns to leyn a verse from the creation story. 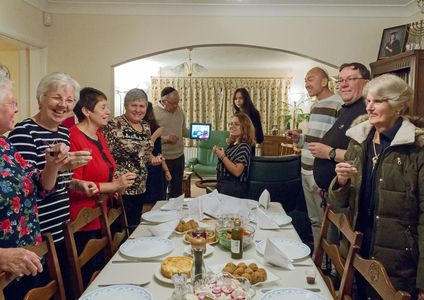 With the celebration of Simchat Torah completed we said goodbye to Karen and Dorothy on Skype before enjoying yet another delicious pot luck supper with everyone, students included, providing a dish. 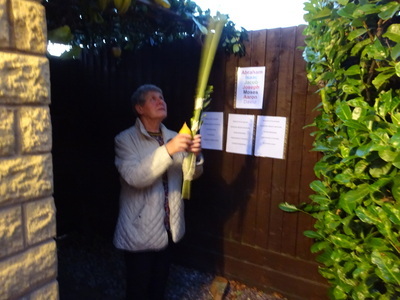 Everyone agreed that this was a very moving and worthy way to celebrate Simchat Torah. Only one or two of us have the skills to do a lot in Hebrew so we had devised a way of keeping the festival that included everyone with readings and especially the chance to get close to and handle the Torah scroll. This third attempt at a ‘leynathon’ had worked really well. Perhaps we have now established our tradition for future ST festivals. On a cool – but dry – Sunday evening of 16 October we all met at Steve and Micky’s home to celebrate Succot. 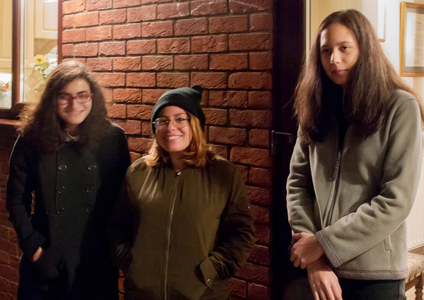 The ‘all’ included 4 students – Naomi, Salomé, Sheleg and Moshe – from Lincoln University. Naomi we all knew very well as she had been a LIM members for over 2 years, but it was very heart-warming to have the other three as well, all of whom had found us via the website and Facebook, which just goes to show how helpful social media can be. D and K joined us from Devon via Skype, which also goes to show how useful modern communications can be. On arrival, we added fruit and branches to the Succah to complete its building, Steve having made the main construction earlier in the day. Steve began the evening leading us through Ma’ariv for Festivals. Armed with our beautiful, transliterated siddurim, everyone could join in. 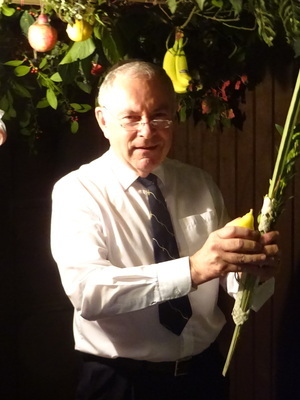 After the Service, Steve gave a very clear, amusing and informative explanation about the festival of Succot, the Lulav and Etrog and the building of the Succah. We then all went outside to enter the Succah and take turns to shake the Arba Minim in the prescribed six directions. 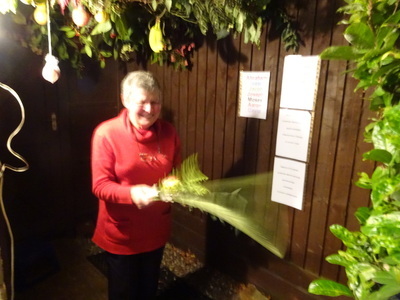 Everyone had a go at entering the Succah. Steve had posted the various brachot on the wall in transliterated format so that even those with little Hebrew could participate. Steve took his IPad outside so that D and K could also ‘enter’ the Succah. We then said Kiddush before closing down the link to Devon. Then came a most delightful and convivial supper comprising different dishes that everyone had brought. One highlight was the delicious apple strudel Peter had made with apples he had taken that morning from his tree. Another delight was the ‘dirt cake’ that Naomi made. 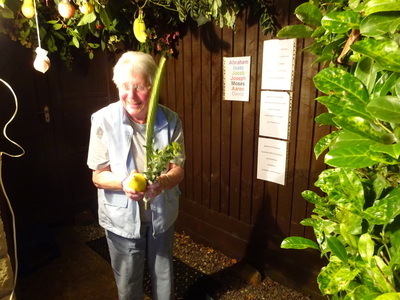 She had introduced us to this rather unusual dish last year and on this occasion she brought it in a flower pot complete with plastic flowers and (vegetarian) green worms! We had a lovely evening filled with good conversation, plenty of banter and friendship. 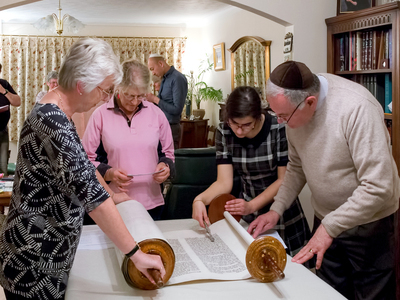 As well as thanking Steve and Micky for their kind hospitality and a memorable Succot celebration, we all left vowing to learn our leyning for the mini-leynathon we will be doing for Simchat Torah in a few days’ time. Everyone has one verse to leyn from the end and one from the start of the Torah. Even those on Skype will be taking part. It should be a fun evening. It was last year. 14 of us gathered at Micky and Steve’s house for Erev Rosh Hashanah. We welcomed Moshe and Sheleg, two new students from the university, along with Naomi who was back from America. 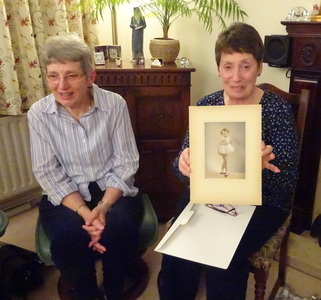 It was lovely to see Dorothy and Karen who had made the long journey from down south instead of linking up on skype. 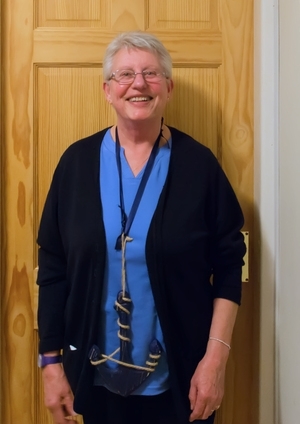 After the service led by Steve, Naomi was put in charge of reorganising the room so we could all be seated to enjoy home-made soup, bread and cake for supper. 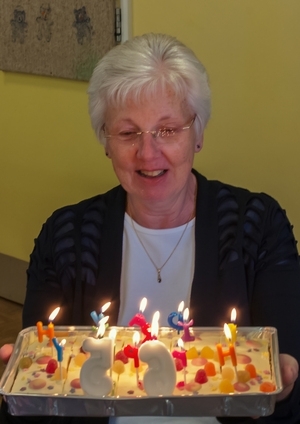 We all sang “happy birthday” to Karen who had celebrated a milestone birthday the day before and presented her with gifts from everyone at LIM. Again 14 of us gathered at Micky and Steve’s house for Rosh Hashanah. The new students had lectures so could not be with us, but we were joined by Ruth and Natan’s friends Brenda and Michael from Grimsby and Maxine and Steve from France. 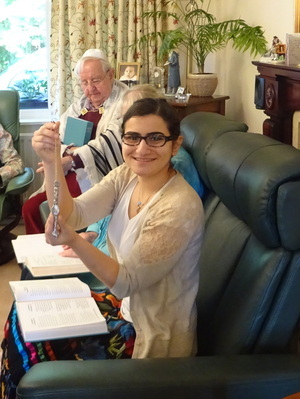 Before the service started, Naomi surprised us all by presenting LIM with a yad for use when reading from the Torah. Steve G led the Shacharit, Torah and Shofar services, Maxine did Haftorah and Dorothy blew the shofar. After the service and the reshuffling of furniture we all sat down to a hearty lunch provided by everyone present. Steve G then led a shiur on the Ten Commandments which made for an interesting inclusive discussion. The day was warm and dry so a walk to the nearby lake for Tashlich which Steve G, Naomi and Michael led. On our return home we all sat down for a drink and chat before departing. All in all this was a hugely successful festival celebration made possible by the simple fact that all LIM members had a role to play, all shared in the catering, all had a genuine desire to enter into the mood and intent of Rosh Hashana and everyone took great pleasure in being together as a community. We were delighted to welcome new Jewish students from the university and to have our LIM friends who live in distant parts back with us again. 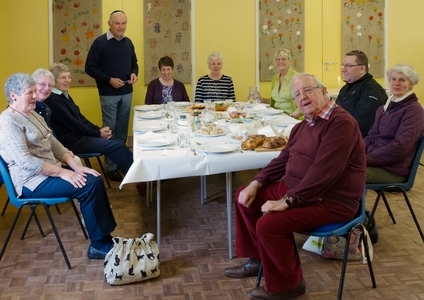 We met in the small hall of St Georges Church for Shabbat Shacharit and Torah services on Saturday, 17 September. Steve did a lovely service as usual. Naomi was back from her summer visit to the States and we were also joined by another ‘young person’ in Salomé from Paris. We joined with Dorothy and Karen in Devon via Skype. After the service we presented Micky with a card and gift from us all in LIM for her ‘significant’ birthday due on 28 September. We also presented her with a birthday cake and sang Happy Birthday after which she blew out the candles. As usual we had a lovely lunch. We then discussed all the catering and other arrangements for the forthcoming festivals of Rosh Hashanah, Succot and Simchat Torah. Hopefully, we will all know what we are doing. Ruth later sent us a matrix of who was doing what to help us all. Peter did his photography duties very professionally as the accompanying photos show. With Shabbat still very late coming in, we all took advantage by meeting at Pat and Peter’s for an evening of music accompanied with great imprecision by Steve on the keyboard. We were delighted to welcome Pawel for the first time to this kind of LIM gathering. He had a lovely bass/baritone singing voice. Steve began the evening with a quick summary of the different forms of music – trop, nusach and niggunim – that we use in our services. He had recently returned from a Jewish Retreat at which he had learnt new niggunim. Soon everyone was warbling away happily, the joy of these niggunim being that they were very tuneful, but simple to learn quickly. These wordless melodies gained power by their very repetition almost like chanting mantras. We then worked our way through a repertoire of favourites from Jewish songbooks and campfire songs finishing as always with Hatikvah, the Israeli National Anthem. 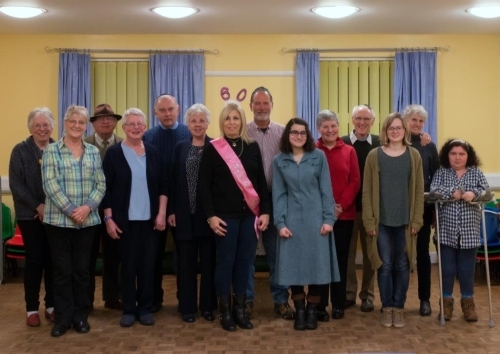 We had decided beforehand to have a main meal before coming to the event After the singing, we therefore finished the meal by indulging in tea and a lovely selection of cakes, tarts and biscuits that everyone had contributed to. These musical evenings have proved to be very popular and a nice gentle break away from the regular Shabbat davening, especially as we were now heading towards the might and majesty of the High Holydays. Before departing, we planned the catering and admin for our next meeting for a Shabbat morning and Torah service on 17 Sep when hopefully Naomi will be back with us after her long summer break from university. In addition to the normal Friday Evening service, we planned an Oneg Shabbat social evening together. The theme this year was Jewish humour with everyone asked to bring their favourite joke, Jewish or otherwise, or whimsical story. With Dorothy and Karen joining in on Skype, we had a minyan and were able to say Kaddish for Steve’s mother during the Kabbalat Shabbat service. 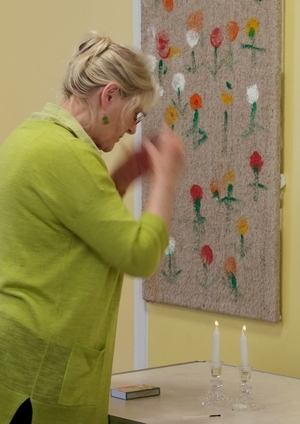 Ruth lit the candles at the start of the service and throughout everyone joined in the singing with enthusiasm born of confidence and familiarity with both the music and the Hebrew text. We then enjoyed Kiddush before saying farewell to Dorothy and Karen. Then came an amazing supper of really lovely foods. This was then followed by a very enjoyable and rib-tickling session of jokes and anecdotes that everyone had brought. 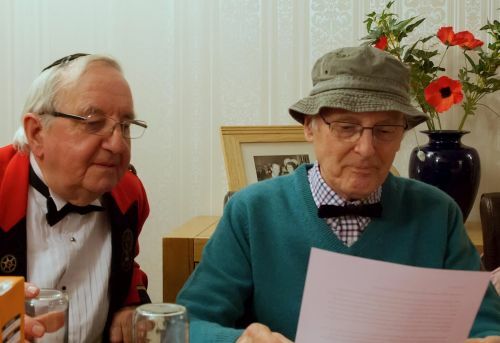 Pat and Peter have volunteered to host our next meeting which will be a Kol Zimra evening of song, taking advantage of the ability to play instruments while Shabbat is still so late in coming in. 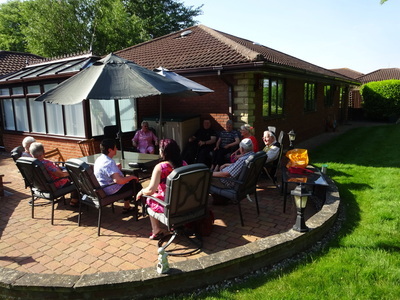 On Sunday 12th June 8 of us met at the home of Steve and Micky for Shavuot. We had decided against an all- night study session and met at 5.00pm instead. Steve had printed copies of the Book of Ruth for everyone so we took it in turns to read the whole story. It is only a short book so we discussed aspects of each chapter as we went along. Steve had also printed some maps of the region so we could see where Moab was where Ruth came from. 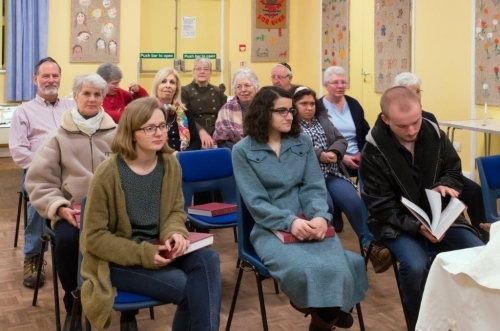 Lots of input from everyone but one point that was raised was how easy it was for Ruth to convert or be accepted as Jewish in comparison to what a proselyte has to go through today. As is the custom with LIM we then went on to eat a whole cheesecake from the Cheese Society plus some fresh fruit salad. Although the cheesecake tasted delicious it was not the usual deep one we get but there were no complaints. We then spent the next hour reminiscing about countries we had all visited and funny stories along the way. 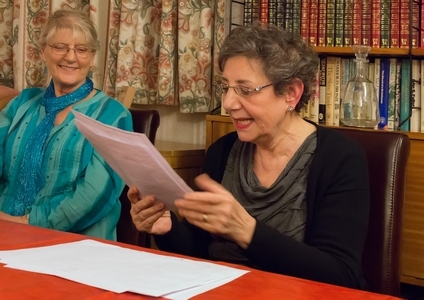 Kabbalat Shabbat on 27 May saw the arrival of a potential new member for our community. 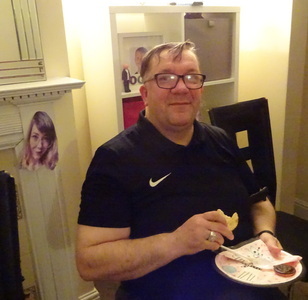 Pavel had been in touch via the website and had agreed to attend service and meal. Pavel was originally from Poland, but had been in this country for many years. We comfortably had a minyan because we were joined by D and K in Devon on Skype. This was just as well because Steve, Jane and Olga all had Yahrzeits and wanted to say Kaddish Yatom. After Ruth had lit the Shabbat candles, Steve led the service, which included some really enthusiastic singing all round. We then celebrated Kiddush while Dorothy and Karen were still with us. 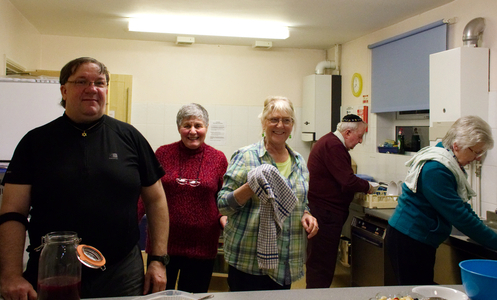 After the service we all enjoyed a warming supper to which everyone had contributed. Natan has apparently claimed the washing up duties for himself. Much as we all want to play with the super clever dishwashing machine, Natan always seems to get there first. Before departing we laid plans for our next meeting which would be TikkunLeyl Shavuot on 12 June. The cheesecake was already ordered! 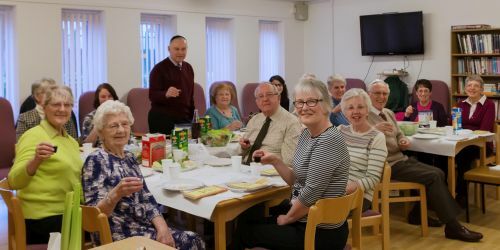 This year, with Seder night being on a Friday, LIM members met to celebrate Pesach at St George’s Hall, there being no competing Zumba classes that evening. We had great pleasure in having Dorothy and Karen with us rather than via Skype. They had travelled from Devon especially to celebrate Pesach with LIM. Unfortunately, Pat was a bit under the weather and could not be with us, but Peter brought Naomi, whose Charoset we were soon all to enjoy. Special guests this year included Revd James Gandon, curate at St Georges, plus Becky and Elspeth, two of St Georges members. We were also delighted to welcome Margaret Ford, Bishop’s Visitor to local schools. Steve had worked closely with Margaret for a recent visit to Eastgate C of E School to talk to the children about Judaism. Micky engaged Elspeth in a deep and meaningful conversation as the guests arrived. Naomi showed Natan photos of the latest fossils she had dug up. Also, before the evening proper started we took the opportunity to present Margaret with a gift from the whole community to celebrate her upcoming special ‘-0’ birthday. 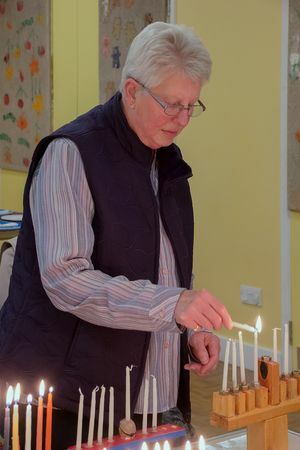 After Edna had lit the candles for both Shabbat and the festival, Steve led the service, providing transliterated Hebrew for all the main elements for those for whom Hebrew was a bit of a challenge. 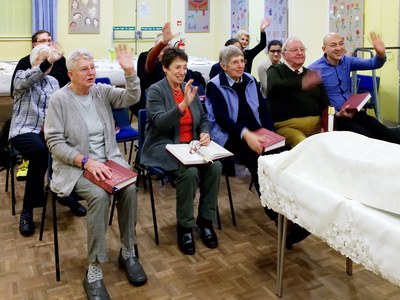 Thus, everyone joined in the singing with great enthusiasm and helped with the reading of the Seder story.Everyone contributed to the delicious Seder meal in a variety of ways. This year we celebrated Purim once again at Pat and Peter’s home. We were delighted to welcome as special guests Jacky and Brian Chernett from London. 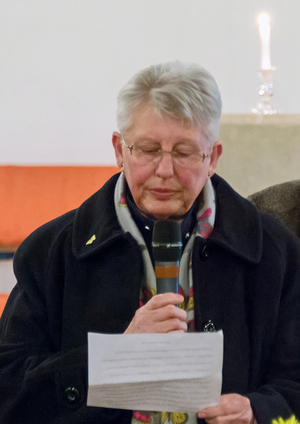 Jacky is the first female ordained cantor in the UK. 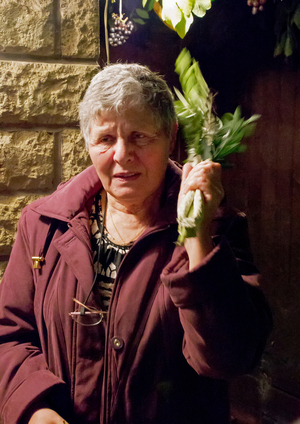 She had come to tell the story of Purim in a very special way. The theme for this year’s party was Pub signs. We had all agreed to come wearing something or enacting something that could be decoded as the name of a typical pub. The photos attached are just some examples and we leave the reader to decode them. No prizes for correct answers except to know that you had joined in the fun of the festival. We began the evening with a lovely supper based on items we had all brought. Jacky then showed us all a real Megilla Esther that she had brought. Naomi can be seen showing particular interest in it. After a short discussion on the more serious topics of the meaning of Purim, the implications of what the story was about and how we were still affected today by threats to our existence, Jacky led us in a hilarious rendition of the story. She read it in English, but, being a skilled Cantor, she chanted it using the special nusach (prayer melody) reserved for this festival. As the readings progressed the cheers and boos and rattlings became ever louder as we heard the hero and villain names. It was great fun with Jacky not only being a highly skilled interpreter of the Megilla, but also a natural entertainer. After the reading we had hot drinks and Hamantaschen. Naomi once again came up trumps with some wonderful Hamantaschen and of course she made far too many, which gave us all an excuse to indulge even more in them. All in all this was a Purim party to remember in so many different ways. Sharing foods, enjoying a tremendously entertaining rendition of the Megilla Esther, behaving crazily and getting away with it, rejoicing in the warm and friendly social atmosphere, being a part of the whole Jewish tradition knowing that communities around the world were being just as daft as we were. Our thanks go to Pat and Peter for once again allowing us the use of their lovely home, and to Jacky and Brian for visiting us from London to enable us to celebrate with such joy and meaning this wonderful festival. Our meeting this month proved to be a very special occasion. We welcomed new guests to our small community. First, was Joel Loynds, a Jewish Lincoln University student who was in his third year of studies. He hailed from Manchester and was seeking an interview for one of his projects. 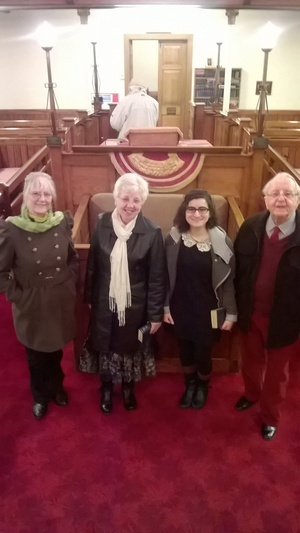 We also welcomed two members of St Georges Church, Elsbeth and Becky, both of whom had long expressed an interest in witnessing a Jewish service. Sarah, Naomi’s Danish friend at the university, was also with us once again and we were joined by Maxine and Steve in person who were over from France on a routine UK visit. With Dorothy and Karen joining us on Skype, we were a good minyan, which was important because we were not only saying Kaddish for Steve T’s father, but also in memory of Di Adler, who had just passed away. 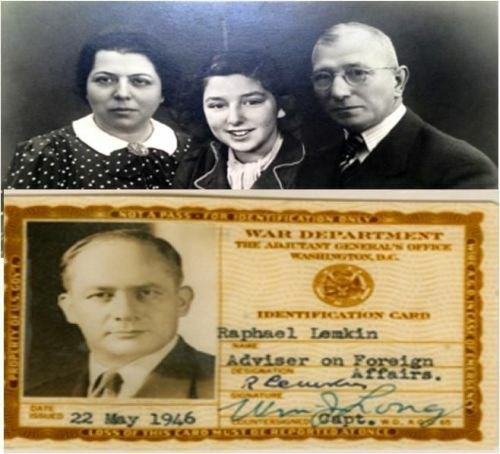 Several LIM members knew Di from early days with the Lincolnshire Jewish Community. We placed the non-Jewish visitors among us so that they could be guided through the service using our fully-transliterated siddur. 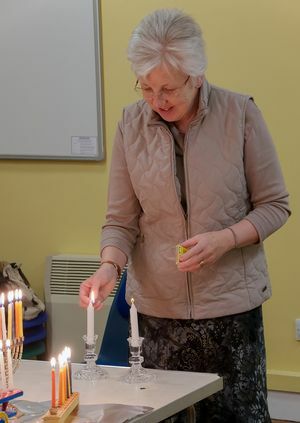 After Jane had lit the Shabbat candles to bring Shabbat in, Steve G led the service and the room was soon resounding to some enthusiastic singing in Hebrew by everyone, visitors included. The latter’s benefit, Steve gave brief explanations of what we were doing at various stages, especially for the highlight elements such as L’Cha Dodi, the Shma, Amidah, Aleynu and the various versions of the Kaddish. 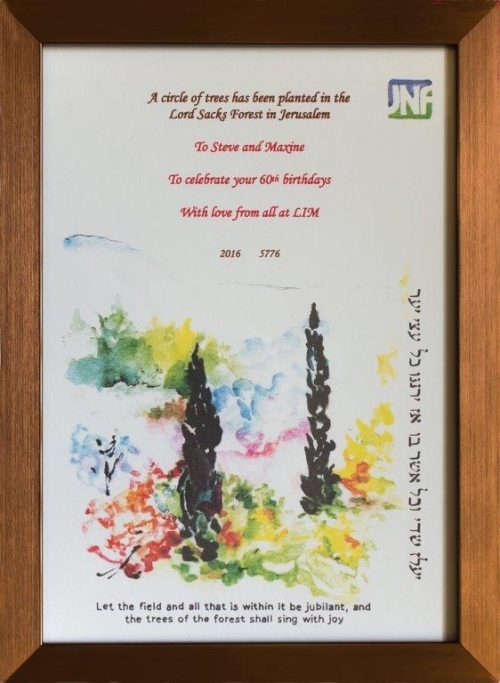 to say that we had planted a small grove of trees in Israel in honour of their 60th birthdays. Maxine’s was in February and Steve’s will be in August. Naomi and Peter had each made a cake for the occasion. an international flavour as Danish Sarah and Swiss Elsbeth conversed happily, while British and American friends looked on. 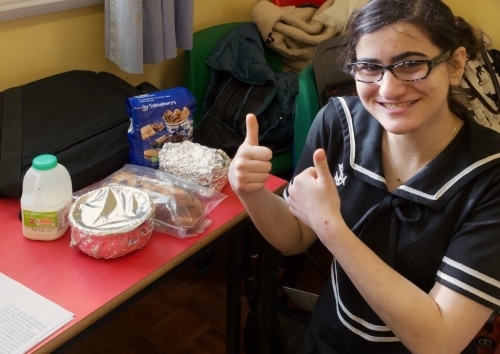 and then as part of clearing up gave left-over foods to a very happy student. This had been a really successful celebration of Shabbat shared with friends and visitors alike. 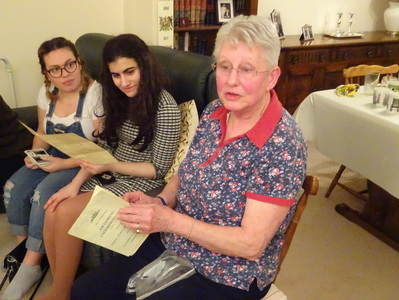 Both Elsbeth and Becky also accepted our invitation to attend the Seder in April. 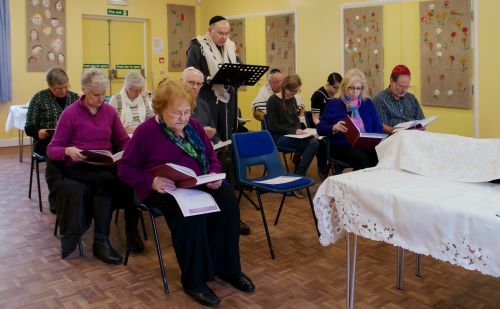 Our small community enjoyed a wonderful celebration of Shabbat Shacharit this week. Unfortunately, we were not quite a minyan because Steve and Maxine were otherwise engaged in France, Yvonne was still too poorly to attend and Edna and Margaret were away. Even so, we enjoyed having Dorothy and Karen join us via Skype. Steve led us all through the Pesukay D’Zimra and Shacharit services. Instead of the Torah service, Steve gave a detailed description of learning how to leyn from the Torah using a Chumash, Tikkun and hours of study. Steve also gave a short Dvar Torah on the messages in this week’s Sidra, Terumah. The service ended with a rousing rendition of Ein Keloheynu, Aleynu and Adon Olam. After the service we made Kiddush while Karen and Dorothy were still with us. We then enjoyed a wonderful lunch together towards the end of which we presented Olga with a birthday cake. After lunch and our Brich Rachamana version of the Birkat Hamazon we planned our next Kabbalat Shabbat service and the Purim party. We are aware that the tiny community in Grimsby meet on the first Friday evening of each month. Try as we might, we have few opportunities to visit them, but one such chance did occur this month. Micky and I, with Ruth, Natan and Naomi travelled the one-hour journey arriving just as Leo Solomon, the shul’s leader, was opening the premises. 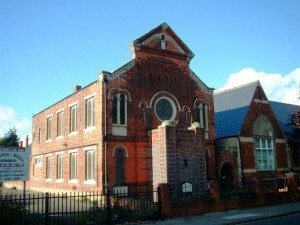 Their shul is a Grade 2 Listed building of great beauty and significant historical interest. The local community have spent a great deal of money and effort maintaining the fabric not least the worries of recent years that the walls were in danger of collapsing. All this has now been fixed, but what cannot be fixed is the fact that time has gradually reduced the size of the community. We five were therefore a welcome addition that enabled them to count a minyan for the first time in a long time. This was the first traditional shul that Naomi had seen. Inside were many citations, plaques, inscriptions and artefacts that told the history of the community. One could tell how prosperous and thriving it had been in its heyday. Leo led us all through a delightful Kabbalat Shabbat and Erev Shabbat service. LIM members thoroughly enjoyed the experience even though Leo’s pronunciation of the Hebrew was less ‘Oxford English’ Ashkenazi and more ‘old school’ Anglo. After Kaddish we all repaired to Steels restaurant in Cleethorpes for what has become our traditional way of ending the evening with a fish and chips supper. We were very pleased to renew our close ties with Leo and his community and hope we will be able to repeat this visit later in the year. 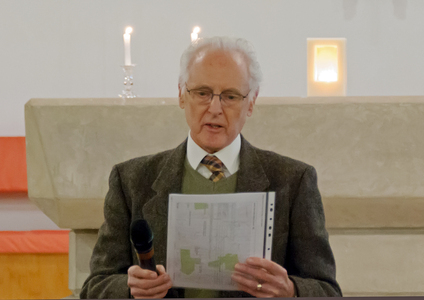 CCJ Lincoln, LIM and St John the Baptist, Ermine jointly organised the 2016 HMD Commemoration in Lincoln held on 27 January 2016 at St John’s Church. Over 100 people attended the event which had received excellent publicity from the local Press and Radio Stations. We followed the theme ‘Don’t Stand By’ chosen by the Holocaust Memorial Day Trust and used some of their materials in the programme. We gathered to learn from the past, to honour those who suffered and those who refused to stand by, and then to pledge ourselves to act in the present. 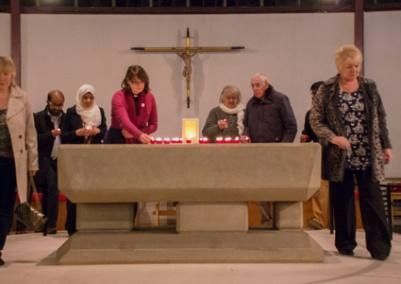 After a welcome by Fr Stephen Hoy, the parish priest of St John’s, CCJ member Dorothy Moss opened the evening by lighting the candle that had marked the 70th anniversary of the liberation of Auschwitz in 2015 when the church was one of seventy chosen nationally to host these special candles. From 1939 – 1941 the Nazis carried out their T4 Euthanasia programme to kill those with disabilities. On 3 August 1941 Catholic Bishop Clemens von Galen refused to ‘stand by’ and delivered a passionate sermon in Münster Cathedral attacking the T4 programme, which he described as ‘plain murder’. 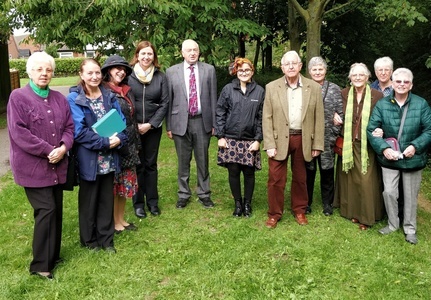 The gathering then heard Ilse Weber’s haunting music “I wander through Teresienstadt”, followed by Jessica Howell from St John’s who read some reflections on the person and work of Sir Nicholas Winton especially in relation to the setting up of the Kindertransport. This led to the playing of part of the Final Movement of Mahler’s 9th Symphony. The recording was particularly poignant because it was by the Vienna Philharmonic Orchestra recorded in Vienna in January 1939; a few weeks after the performance, the orchestra was purged of all its Jewish musicians, including the conductor, Bruno Walter. 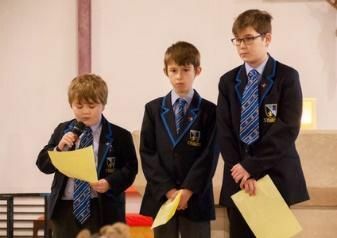 Three students from Lincoln Castle Academy shared some poems that they had written based on their own reflections on the theme for the day. 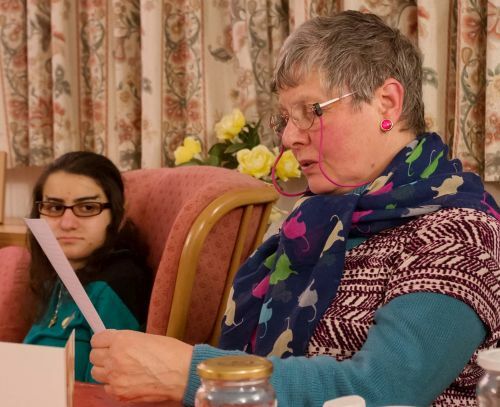 Jackie Howell, Reader at St John’s read the story of ‘The Good Samaritan’ from St Luke’s Gospel, a biblical exemplar of someone who chose not to stand by. Having heard all this information, we moved on to consider our response to the question, “Will We Stand By?” in the face of the ongoing threats from antisemitism, race hatred, Islamophobia in our own country - all of which sow the seeds of persecution and genocide. We pondered this question as we listened to more music: “The Death Camps” by Carl Davis. We then came to our Act of Remembrance which began with Steve Griffiths, Lincoln Independent Jewish Minyan, reading a ‘Catalogue of Man’s Inhumanity’ emphasising that the commemoration was not just about the Holocaust, but the various genocides of the past 100 years as well, referring topically to the seeds of a genocide even today in the treatment of Aziris, Christians and fellow Muslims by IS forces in Iraq and Syria. He followed this by the Jewish Memorial Prayer and, with a minyan of Jews present, was able to lead them in saying Kaddish for the departed. Fr Stephen then invited everyone to come forward and light a Memorial Candle to be placed on the altar. This was a very moving experience as the church lighting was gradually dimmed as the glow from the altar increased. It was especially moving to see members of the local Muslim community attending this event, adding to the interfaith and integration of our three Abrahamic faiths in Lincoln. 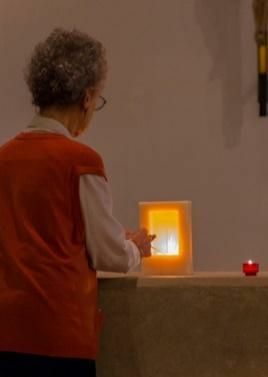 With the memorial candles lit and a short period of silent reflection completed, Fr Stephen read a litany and the evening concluded with both Jewish and Christian Blessings given by Steve and Fr Stephen. This was a challenging evening and we hope that we have encouraged those who attended to be more aware and active in the future in the fight against extremism, intolerance, violence and prejudice. During the light refreshments afterwards we were able to meet with the members of the local Mosque who extended an invitation for us to attend their open day in a few days’ time. This will afford us the opportunity to continue this essential interfaith dialogue and many of us from both the Christian and Jewish community readily accepted the offer. Our thanks to Fr Stephen and his congregation for their hospitality, including the refreshments at the end, and to everyone who took part. Our Independent Minyan started the New Year on a very positive note with a delightful Kabbalat Shabbat service and meal. 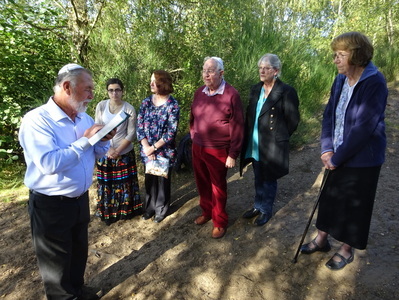 We were well over a minyan on this occasion because not only were we joined by D and K in Devon on Skype, but also by Maxine and Steve who were back home in France. And we were able to welcome Naomi back after her visit back to Chicago for the festive season. In addition, Mike Kushner, who was over from Cape Town South Africa visiting family, had been in touch through the website to ask if he and his father could join us. They both arrived well in good time and were made warmly welcome by the whole community. Sadly, once again Yvonne was too poorly to join us. We remembered her very purposefully when we said prayers for those in need of healing. 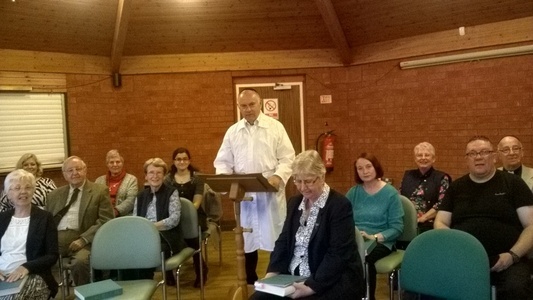 Steve led the service, which included saying the Mourner’s Kaddish to support Steve T who had very sadly lost his father very recently. We all wished him Long Life and were pleased that we were able to offer communal support even from a distance. Jane was also saying Kaddish as was Edna. 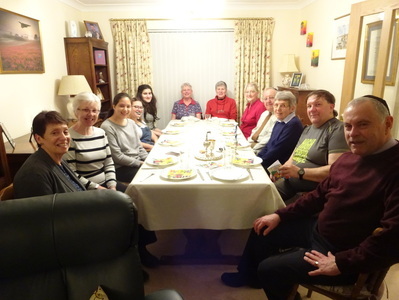 After the service we all enjoyed a warming supper of veggie hotpot followed by fruit crumble that was just the ticket for a very cold and wintery evening. Before departing we laid plans for our next meeting which would be on the morning of Saturday, 13 February, when we hoped to welcome Steve and Maxine in person as they would be planning a visit back to the UK then. 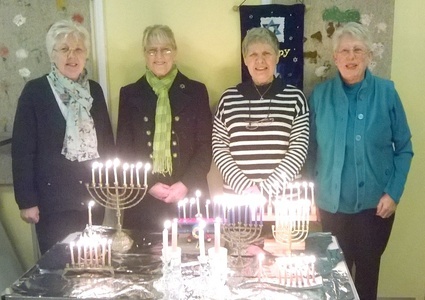 On Friday 11 December we celebrated our 5th Hanukah together. Only Maxine and Steve were unable to join us being currently on a visit Stateside. 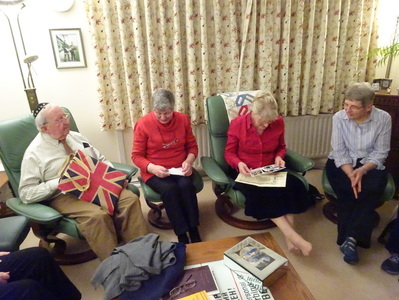 With Karen and Dorothy joining via Skype, we were also delighted to welcome Edna and Margaret. Also, Naomi was with having yet to finish the semester. 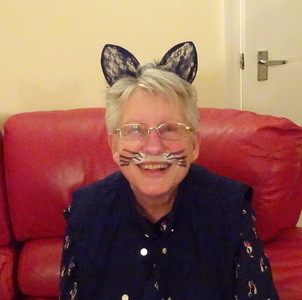 Sadly, only Yvonne was still too poorly to be able to join us and we know how much she enjoys these parties. We started by lighting the Hanukah candles and singing Ma’ozTsur. Micky then lit the Shabbat candles. Steve led a rather shortened Kabbalat Shabbat service. Then came the gift giving. Dorothy and Karen had sent a large and rather mysterious parcel. On opening it, we discovered most thoughtful and apposite gifts for everyone present. Even though they could not be with us in person, we really felt the warmth of their friendship and commitment to our tiny kehilla. Afterwards we held our 5th AGM which in true LIM fashion lasted just over 2 minutes. The only item of substance was the finances and Mr Macawber would have been very happy with our situation. We could look back on a year of full activities, services and socialising and yet we ended the year with slightly more than we had begun it. 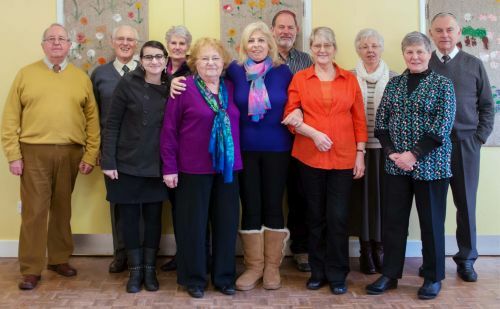 Before saying farewell to Devon we did Kiddush and then, after washing and making motsi, we sat and ate a delicious meal of the traditional potato latkes, salads and other goodies, culminating in the anticipated superb doughnutsthat Edna and Margaret brought from their local bakery. Before ending the evening we all wished Naomi a safe flight back home to Chicago for the coming holiday season.All in all this was a wonderful way to celebrate our 5th year together and we are all entering the new year with great confidence for the future of the community despite our being rather more dispersed than ever before. 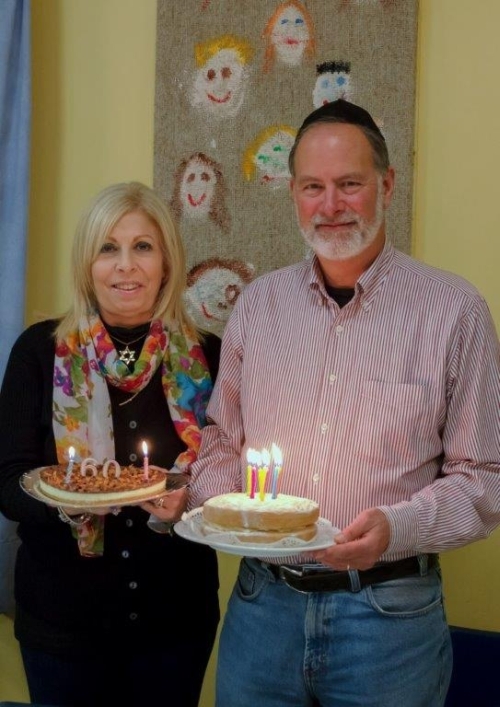 This was our first Kabbalat Shabbat after the High Holydays and the ensuing major festivals. The Chagim are spiritually and communally rewarding, but emotionally exhausting so it was a welcome experience to return to the old tried and tested rituals of a regular Friday evening. 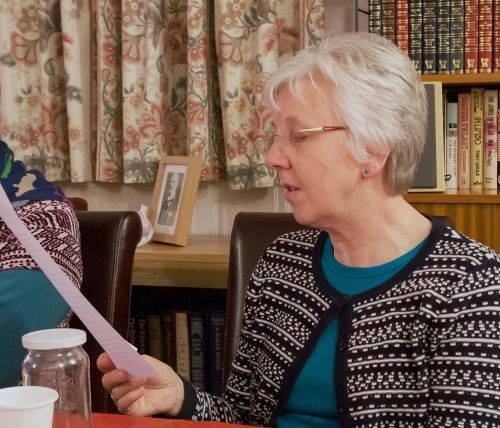 With Maxine and Steve now away in the States, we nevertheless had a minyan with Edna and Margaret making a welcome return with Naomi and with D and K joining us via Skype from Devon. Steve led the service with everyone joining in with the singing. It really was a delight that we can now all participate so fully in Hebrew. We are blessed to have the use of the EytRatson siddur. 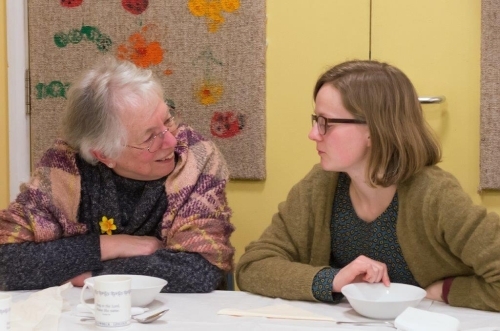 After the service we all enjoyed a convivial and delicious supper together. We then planned our next meeting which would be the Hanukah party with its attendant 2½ minute AGM. 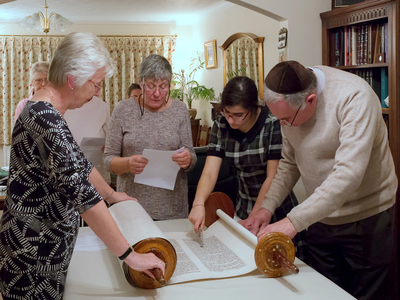 This was the second year in which we attempted a mini ‘leynathon’ whereby everyone read one verse from the final chapter of the Torah and then, after re-rolling the scroll, one verse each from the beginning. 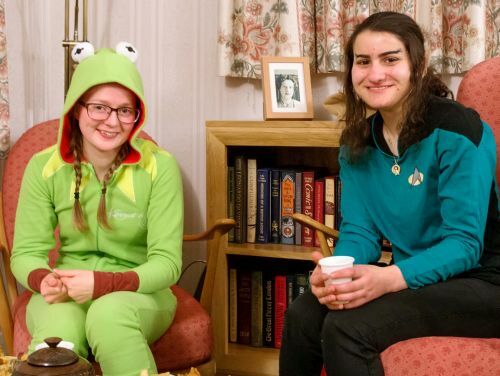 We were delighted to welcome not only Naomi, but also her university friend Sarah. Edna and Margaret were away and Yvonne was still suffering poor health. With still no Wi-Fi in France we could not connect with Maxine and Steve, but we were successfully linked to D and K in Devon. 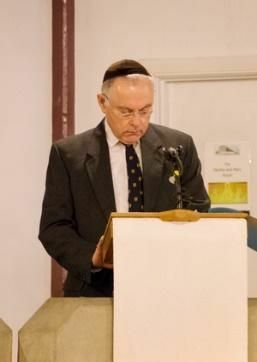 Steve explained how, traditionally, a community would honour two deserving members by appointing them as Chatan Torah and Chatan Bereshit to read the Brachot before the Torah readings at the end and then the beginning of the Torah. Since everyone in LIM was equally deserving of honour he called everyone up to take part in the leyning of the final 12 p’sukim of the Torah. Half the fun was getting everyone in the right order, not forgetting those on Skype. Steve leyned the verses of those missing with Sarah reading the English translation. Throughout, Naomi followed the text in the Torah. Another Simchat Torah tradition would be for members to dance 7 times around the synagogue carrying the Torah. These Hakafot would be hugely exciting and accompanied by great joy. The trouble LIM has is that the Torah weighs a ton and we need two just to do Hagba. So Hakafot were off the menu. 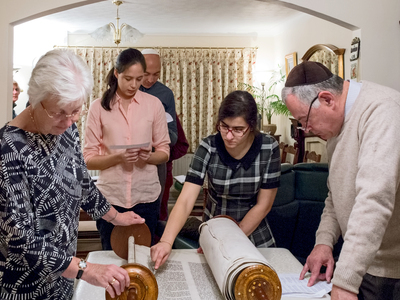 To enable everyone to participate, to get close to the Torah and better still to feel confident in handling it, he then invited everyone to take turns to be at the ‘rolling’ end and at the ‘steadying’ end. This being the third year we had done this, everyone soon got back into the swing of the process taking great care and reverence for the scroll. At last Bereshit hove into view. Steve then got everyone lined up in the right order to take turns to leyn a verse from the creation story. Micky had been under the weather and therefore not able to take part to avoid spreading germs, so we had asked everyone to have the ‘main course’ of their evening meal before coming. 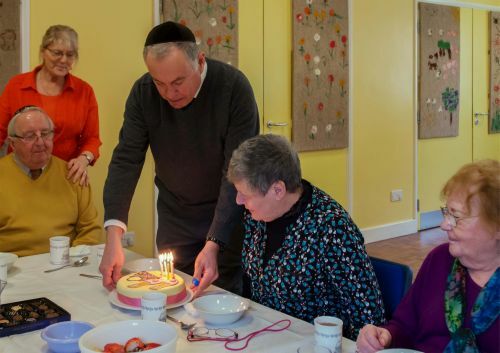 With the celebration of Simchat Torah completed we said goodbye to Karen and Dorothy on Skype before enjoying apple crumble that Steve had made (under supervision, of course) and some lovely gluten-free cake. 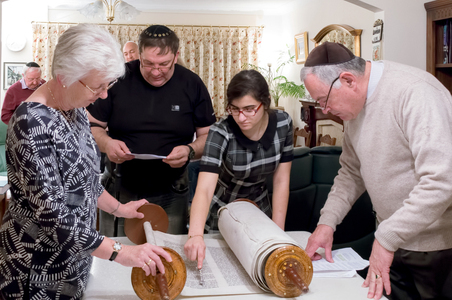 Everyone agreed that this was a very moving and worthy way to celebrate Simchat Torah. 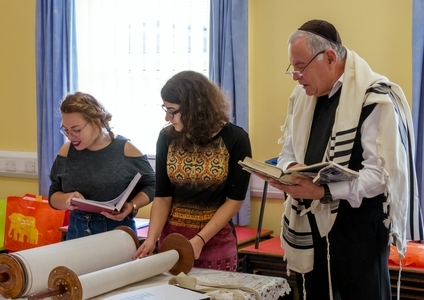 Only one or two of us have the skills to do a lot in Hebrew so we had devised a way of keeping the festival that included everyone with readings and especially the chance to get close to and handle the Torah scroll. This second attempt at a ‘leynathon’ had worked really well. Perhaps we have now established our tradition for future ST festivals. We met once again in Steve and Micky’s home since they have the means to erect a Succah. 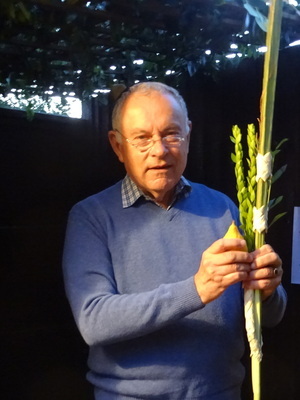 They had also bought the Arba Minim (Lulav and Etrog) when they were in London recently for Yom Kippur. As usual LIM members brought a delicious array of different foods for supper. 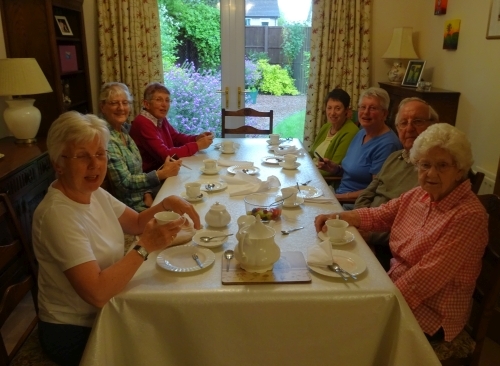 We once again enjoyed the company of Naomi, Edna and Margaret, Ruth and Natan, Olga, Jane and Pat and Peter. Unfortunately, Maxine and steve back in France still have no Wi-Fi connection and D and K in Devon could not connect because they had painters in the house. Sadly, Yvonne was still under the weather and not able to join us. Steve began the evening with a shortened version of Kabbalat Shabbat. Armed with our beautiful, transliterated siddurim, everyone could join in. 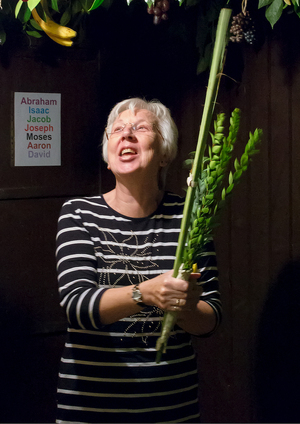 After the Service, Steve gave a very clear, amusing and informative explanation about the festival of Succot, the Lulav and Etrog and the building of the Succah. We then all went outside to enter the Succah and take turns to shake the Arba Minim in the prescribed six directions. Despite forecasts of doom and gloom we were lucky to have no rain at all while we were outside. 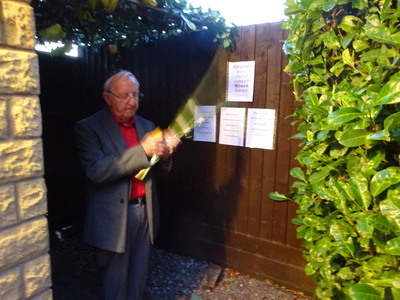 Everyone had a go at entering the Succah. 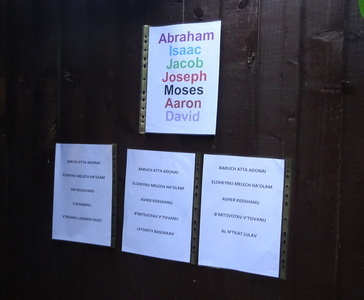 Steve had posted the various brachot on the wall in transliterated format so that even those with little Hebrew could participate. Then came a most delicious and convivial supper comprising different dishes that everyone had brought. Everyone left well satisfied with a memorable Succot celebration and vowing to learn their leyning for the mini-leynathon we will be doing for Simchat Torah in a few days time. Everyone has one verse to leyn from the end and one from the start of the Torah. Even those on Skype will be taking part. It should be a fun evening. We are delighted that we have now held Rosh Hashanah services for the fourth year in a row. This year Yvonne, Edna and Margaret were all away and could not be with us. We were also delighted to have Naomi, back from the summer break, Maxine and Steve here on a visit from their new home in France, plus Dorothy and Karen up from their delightful abode in Devon. Steve G led the Erev RH service which went very smoothly with everyone quickly picking up the nusach and melodies that were special for Rosh Hashanah. Afterwards, we all enjoyed a wonderful soup made by Micky with round challah bought by Steve G followed gluten-=free cake made by Pat and Peter. All of it was gluten-free (except the challah) so that Dorothy could fully enjoy the meal free of any dietary worries. After the meal, Steve G issued everyone with their ‘homework’ for Simchat Torah. 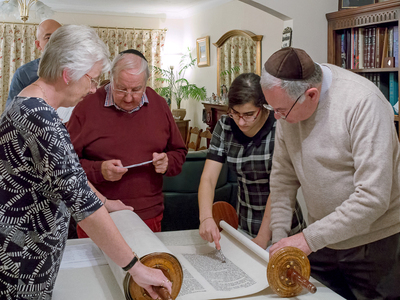 We had all agreed to try to do another ‘leynathon’ for ST like we did last year whereby everyone reads one verse from the final stages of the Torah and then, after rerolling it to the beginning, everyone reads a verse from the opening chapter. The next day we all met at Micky and Steve’s home for services. Wearing a traditional Kittel, Steve led the services starting with Pekuday D’Zimra. He had explained how the nusach would be different from the nusach used on regular Shabbat services. All the members soon got into the mode and mood of this music and, with the help of the Eit Ratson Machsor, quickly joined in the Hebrew passages as much as those in English. 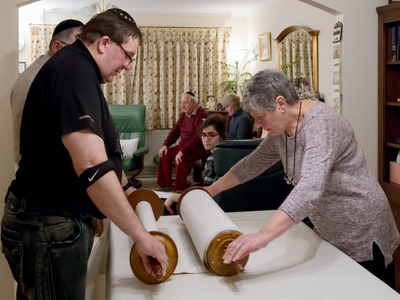 After Shacharit and the long Amidah, Steve led the Torah service using the beautiful, but extremely heavy, Torah scroll that had been a gift from the York community. Just about everyone had a role to play in this service. Natan, Karen and Jane each had call-ups for the Torah readings, Naomi followed the readings in the scroll, Ruth opened and closed the ark, Olga read the prayers for the Royal family, Steve T helped with Hagba and re-dressing the Torah while Dorothy once again blew the Shofar during the Shofar service with great sensitivity, dedication and integrity. She enabled this high point in the service to have real depth of meaning and intent. It has not been LIM’s custom to do the Musaf service so, after Aleynu, Kaddish Yatom and Psalm 27, we finished with a stirring rendition of Adon Olam. This put us all in the mood for the delicious lunch that followed, preceded of course with Hamotzi led by Maxine. Everyone had helped with the catering to weigh the table down with a fabulous choice of savoury and sweet foods. 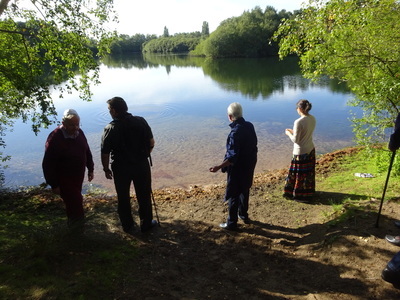 After the shiur, we had a very pleasant stroll in the wonderfully warm late summer sunshine to the nearby Hartholme Lakes where we engaged in the ceremony of Tashlich. Micky, Steve T and Olga stayed at home to sort out the rooms after the service and lunch. At the lakeside, Steve G explained the purpose and history of Tashlich and the symbolic casting of sins into the waters in the form of breadcrumbs. This ceremony had not always met with favour over the centuries with some rabbis claiming that it called on the superstitions and mystical beliefs of the supernatural, which were contrary to Judaic teachings and belief. But the simple ceremony retained its popularity with the common folk and remains widely observed today even among the more orthodox. After reading the short Tashlich service in the Machsor we each took turns in casting our sins away into the lake. Dorothy, who, being gluten-free preferred not to handle the breadcrumbs directly, had her own unique way of casting into the water provided she took enough allowance for the gusty wind. After we had each done this we then spent a few minutes in quiet, private reflection or gentle discussion on the purpose of the ceremony and its impact on us. The day finished back at Steve and Micky’s with a delightful hour or so of socialising with drinks and light refreshments. All in all this was a hugely successful festival celebration made possible by the simple fact that all LIM members had a role to play, all shared in the catering, all had a genuine desire to enter into the mood and intent of Rosh Hashana and everyone took great pleasure in being together as a community. Just before we enter the High Holydays proper, we had a final opportunity to meet for a Kabbalat Shabbat evening at St Georges. This was the bank holiday weekend, but we still managed to have a minyan thanks to the presence of Elliott who was a welcome extra guest. We were thus able to Kaddish for Jane’s friend, Steve’s father and Ruth’s mother.In addition, Ruth and Natan had brought a devout Catholic friend along. Steve led the service with everyone joining in even louder and more confidently than ever. This was our first Kabbalat Shabbat for some months having done other things over the summer months. It was so nice to return to old, familiar melodies and spiritual liturgy. 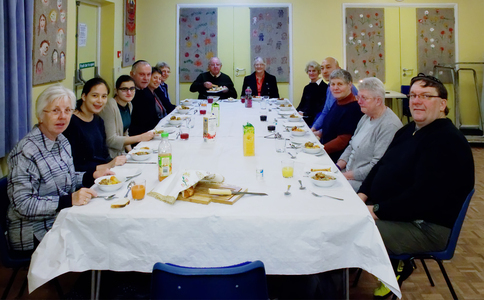 After the service we all enjoyed a convivial and delicious supper together. 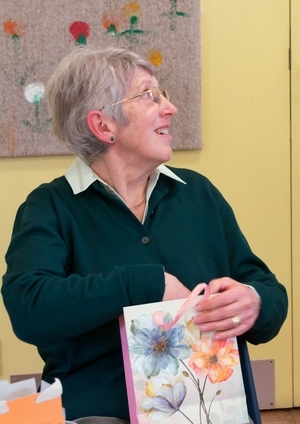 We were pleased to hear how much Ruth’s friend had enjoyed the service. We were also pleased to have Elliott’s company and to catch up on news. With Shabbat still very late coming in, we all took advantage by meeting at Pat and Peter’s for an evening of music accompanied with great imprecision by Steve on the keyboard.We were few in number because Naomi was still away for the summer, Yvonne was not in the best of health, neither Skype connections were possible and Edna and Margaret were away. 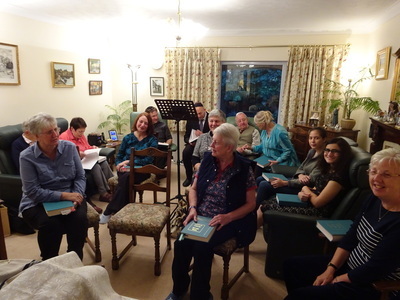 Despite being fewer in numbers we made a good sound working our way through a repertoire of favourites from Jewish songbooks and campfire songs. Steve also led the gathering in the repetitive chanting of niggunim. These wordless melodies gained power by their very repetition almost like chanting mantras. Afterwards, we enjoyed veggie pizzas and some nice desserts. These musical evenings have proved to be very popular and a nice gentle break away from the regular Shabbat davening, especially as we were now heading towards the might and majesty of the High Holydays. 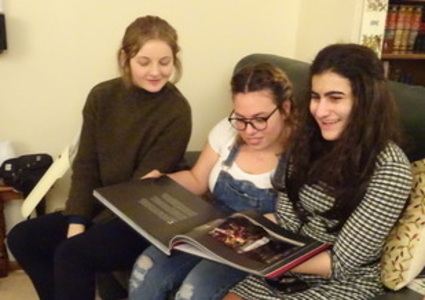 Rather than have a normal Friday Evening service, we had planned instead to have a social evening together not least because the light evenings and late start to Shabbat meant we could fill in the time with non-Shabbat activities. The theme this year was for everyone to bring 5 questions of their choice on any topic of their choice. We would each take turns to be quiz master. 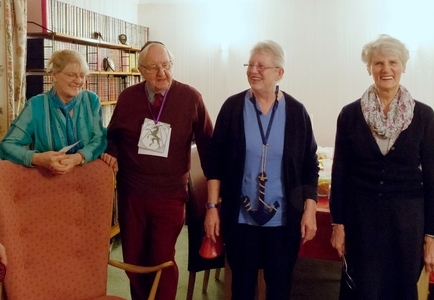 The questions were all typical of the trivial pursuit game, mainly general knowledge, but one or two speciality areas, not least the need for arcane knowledge of the County of Lincolnshire. With Dorothy and Karen joining in on Skype, this all made for a very enjoyable 45 minutes or so with everyone a winner, one or two a bit wiser than before and no-one embarrassed by lack of knowledge. It was conducted in the spirit of having fun together and enjoying the social cohesion. We then enjoyed Kiddush before saying farewell to Dorothy and Karen. Then came an amazing supper of reading lovely foods. 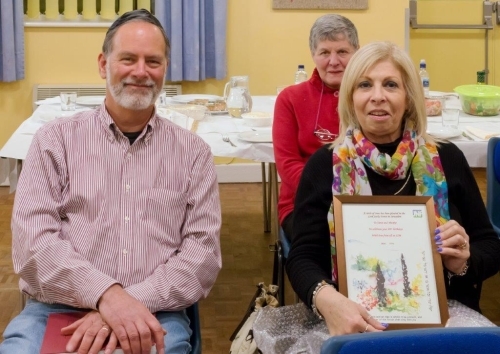 Pat and Peter have volunteered to host our next meeting which will be a Kol Zimra evening of song, taking advantage of the ability to play instruments while Shabbat is still so late in coming in. We had planned well in advance to hold a Shabbat morning service today, but as the day approached we realised that this would not be possible. We would be well short of the essential minyan, partly because folks usually connecting on Skype were away, and partly because a few of us in Lincoln were either under the weather, or also away. A quick change of plan saw Steve, Micky, Olga, Jane, Ruth and Natan – plus Micky’s mother, Lorna – decamp to the wonderful Bardney Heritage Fish Restaurant for a delightfully social luncheon. 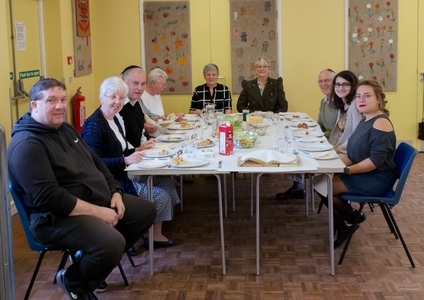 The meal was its usual excellent self and we all enjoyed the shared companionship of our small community even though we were not able to run a synagogue service on this occasion. 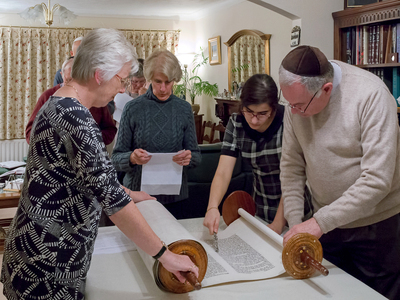 As is now our custom, LIM members met on Shavuot at Steve and Micky’s home to celebrate Shavuot with a short study session and a lot of cheesecake. This year we were pleased to welcome Maxine and Steve in person as they were over in the UK on a visit. We also connected with Dorothy and Karen by Skype. This year Steve devised a simple crossword as a way of getting folks to think about Shavuot, the Torah, other festivals and other things Jewish. There was also to odd secular clue to make the words fit. Between them everyone got all the clues correct even if no one of them got all of them all correct by themselves. Steve had emailed the crossword to Devon so that D and K could join in. 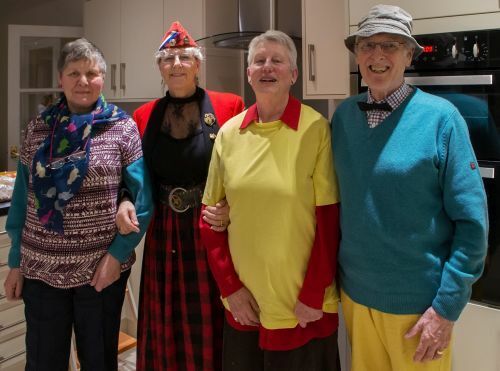 After wishing Dorothy and Karen ChagSame’ach and disconnecting with them, we all enjoyed the excellent cheesecake bought from The Cheese Society shop in town. This was accompanied by some gorgeous fresh fruit salad for those with a guilty conscience about ruining their diet. Steve had deliberately kept the study aspects more light-hearted and fun this year after previous years of more in-depth and serious discussions. We can never seek to emulate the fully-fledged communities who study all night long, but we did what we knew we could and all felt well prepared to receive the Torah, even if only figuratively. 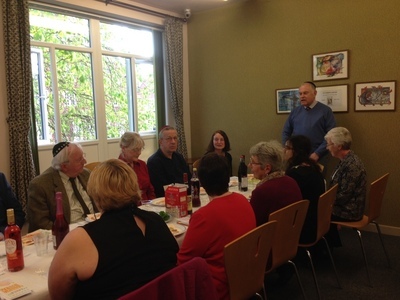 Once again LIM members met to celebrate Pesach, this time at Moorside Court, the home of Micky’s mother, Lorna. 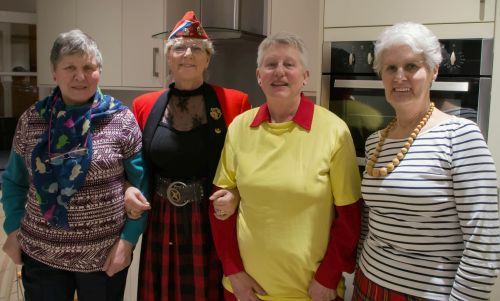 Although Maxine and Steve were still overseas in France trying to settle into their new home, we did have the great pleasure of having Dorothy and Karen with us. They had travelled from Devon especially to celebrate Pesach with LIM. 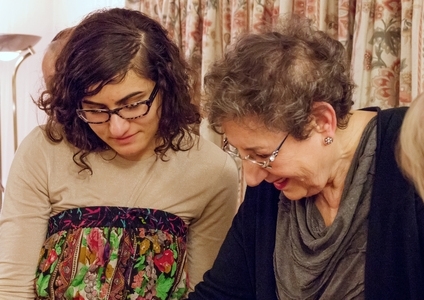 This was also a first time for LIM to welcome Naomi to our Seder table. 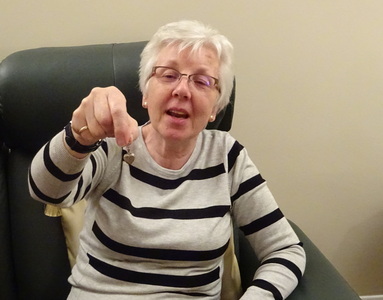 As well as Lorna, we were able to enjoy the company of another Moorside Court resident, Gill. Everyone contributed to the delicious Seder meal in a variety of ways. Steve led the service, providing transliterated Hebrew for all the main elements for those for whom Hebrew was a bit of a challenge. Thus, everyone joined in the singing with great enthusiasm and helped with the reading of the Seder story. This was another wonderful evening of friendship, laughter, communal generosity and co-operation, everyone having something to contribute, everyone taking away a happy memory of a festival celebrated in traditional style, but in a manner that enabled everyone to participate. This year we celebrated Purim at Pat and Peter’s home. 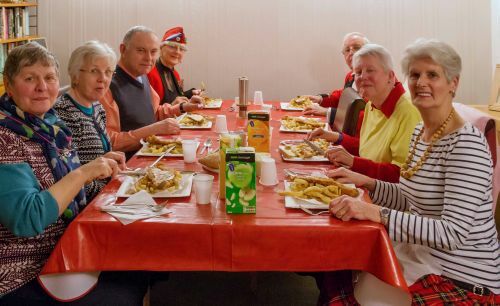 We all arrived in good time to get settled in before Peter and Steve popped round to the Metheringham chippie to collect our suppers. These proved to be as delicious as advertised with generous portions and still nicely hot. After the supper, Karen and Dorothy joined us on Skype. We were also very pleased to have Naomi and her friend Sarah with us. Unfortunately, Maxine and Steve were still unable to get Wi-Fi to join us from France. Yvonne, Edna and Margaret were also missing having prior commitments. All the absentees had sent their love and best wishes for an enjoyable and fun Purim party. Steve had prepared the Megilla Esther and allocated a chapter for each of us to read, in English, of course. He had sent in advance a chapter each to Dorothy and Karen. He also gave each of us a list of Haman’s sons so that we could all join in the rapid reading of their names in Chapter 9. We were also armed with home-made ‘greggers’, varying in loudness depending on how many dried peas had been used and how tinny the container. As the readings progressed the cheers and boos and rattlings became ever louder as we heard the hero and villain names. It was great fun. Everyone managed to read the ten names of the sons in one breath. Purim is the one festival that allows everyone to be just a little silly and we certainly managed to do that. The theme for this year was to dress in poor taste, ie either appalling fashion sense or dreadful colour co-ordination. As the following photos show, no-one failed to enter into the spirit of the occasion. Everyone had something daft about the way they had dressed which gave rise to a great deal of amusement on first being seen. We could not get a clear enough photo, but who will forget Karen’s amazing teapot cosy head dress that made her look like a Pasha from Byzantium, while Dorothy had either been out fishing or chasing dragonflies. Naomi once again came up trumps with some wonderful Hamantaschen to devour with the teas/coffees after we had read the Megilla. All in all this was a Purim party to remember in so many different ways. Sharing foods, enjoying our own rendition of the Megilla Esther, behaving crazily and getting away with it, rejoicing in the warm and friendly social atmosphere, being a part of the whole Jewish tradition knowing that communities around the world were being just as daft as we were. 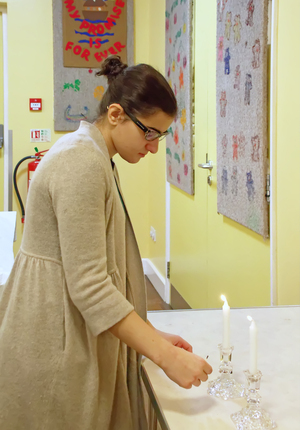 Our small community enjoyed a wonderful celebration of Shabbat Shacharit this week. Happily, Steve and Maxine were in the UK on a brief visit from France. We also welcomed Yvonne and Naomi and had the pleasure of celebrating Olga’s birthday. With Edna and Margaret away and Jane absent still recovering from a recent bout of poor health, we were nevertheless a completed Minyan with the link to Dorothy and Karen via Skype. Steve led us all through the Pesukay D’Zimra and Shacharit services, followed of course by the Torah service. The reading this week was Mishpatim. Before calling up the first Aliyah, Steve explained the content of the Sidra and focussed on the section that would be read out loud. Everyone had a copy and so could follow. It was lovely to be able to call up Naomi for the first time. Maxine followed the text in the scroll while Steve leyned from the Chumash. Before returning the scroll to the ark, Dorothy via Skype read the prayers for the community, Israel and the Royal Family. Steve then led everyone in a rousing rendition of Ein Keloheynu, Aleynu and Adon Olam. towards the end of which we presented Olga with a surprise birthday cake. courtesy of Peter’s clever remote control thingy. 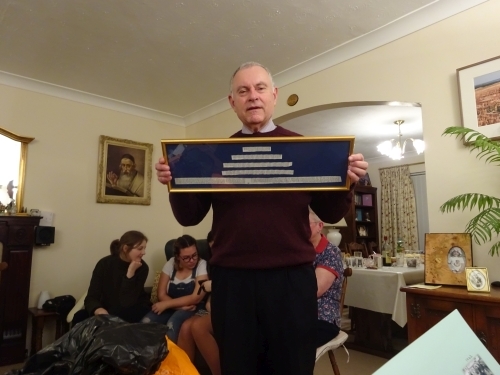 The only sad aspect of our meeting was news just in of the passing of Don Gould, whom several of us knew very well from the days when we belonged to the Lincolnshire Jewish Community.